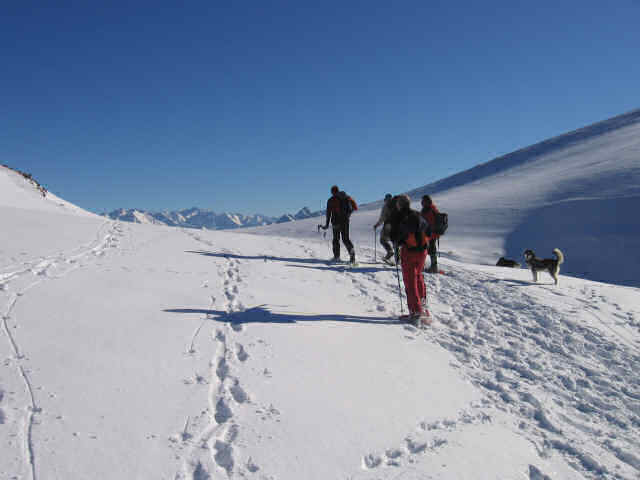 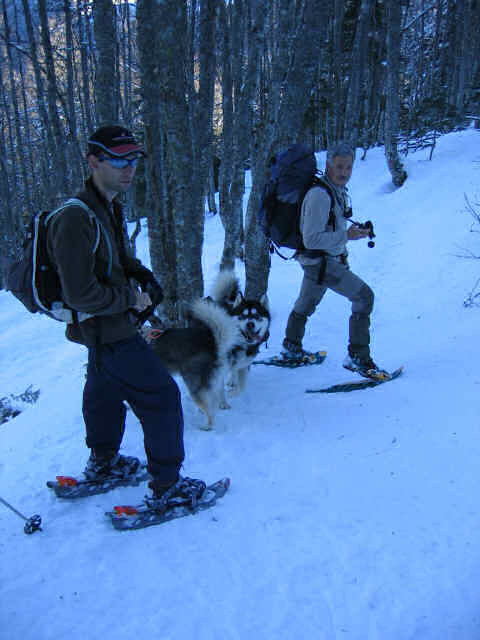 Pictures of mountain hiking and snowshoeing. 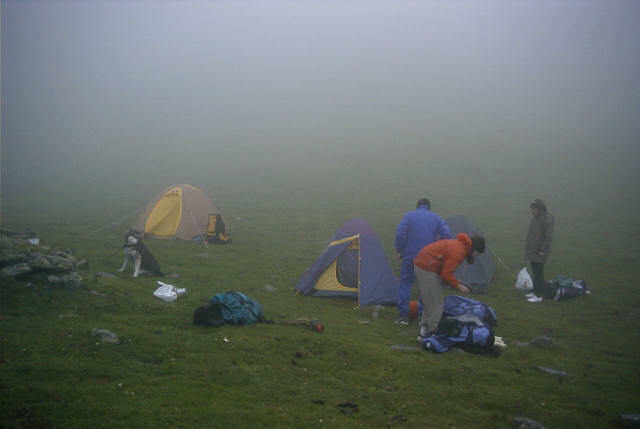 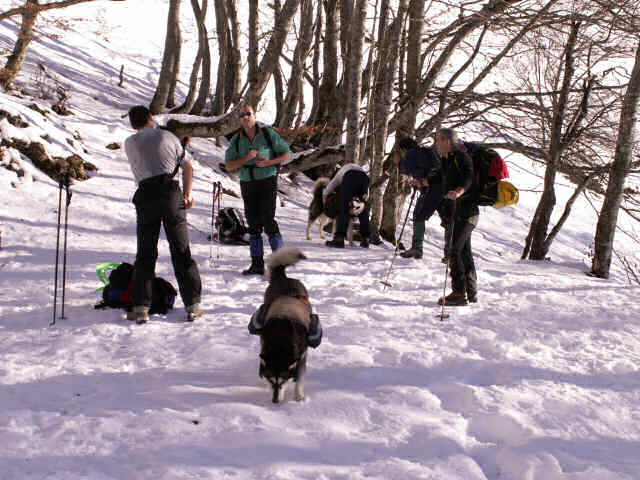 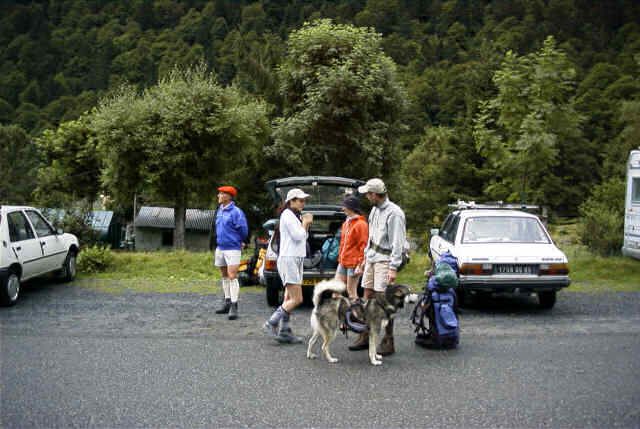 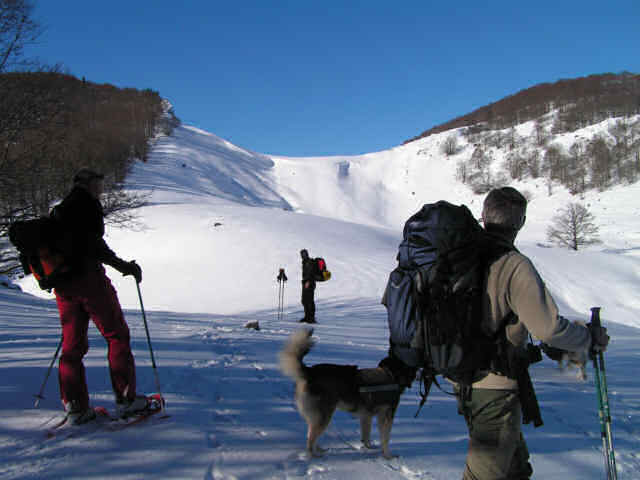 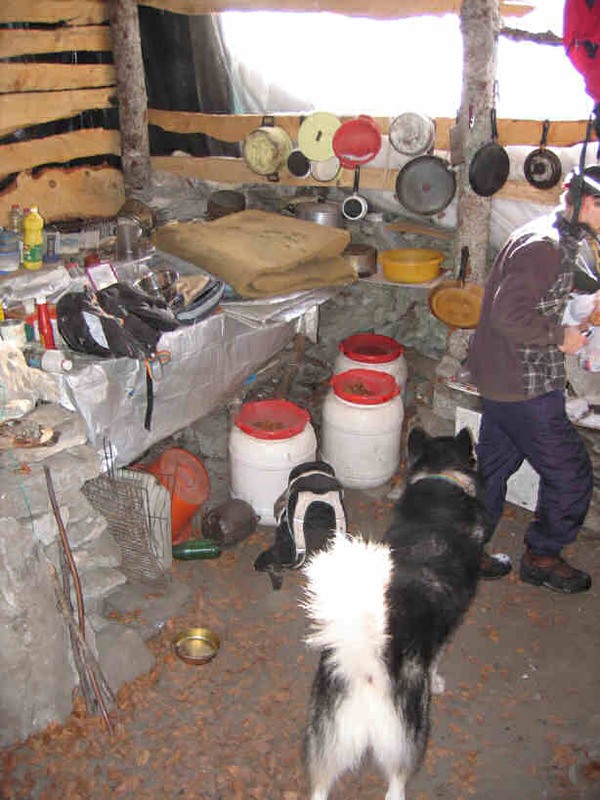 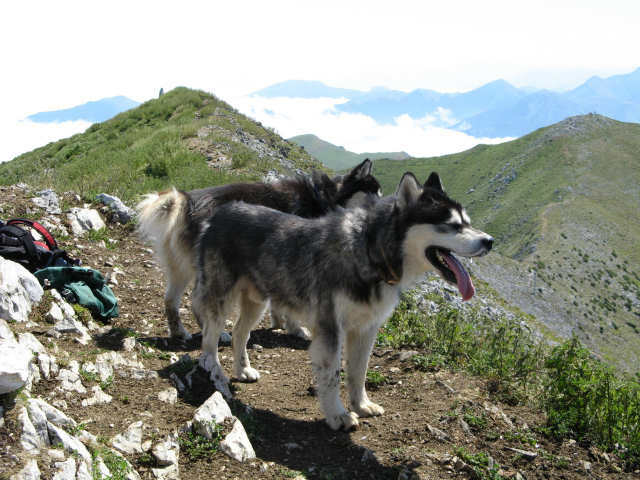 Here, I will speak the necessary equipment only for the dogs for hiking not for human beings. 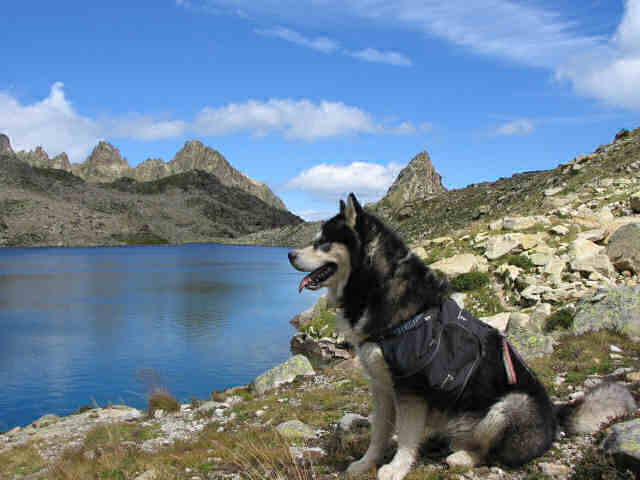 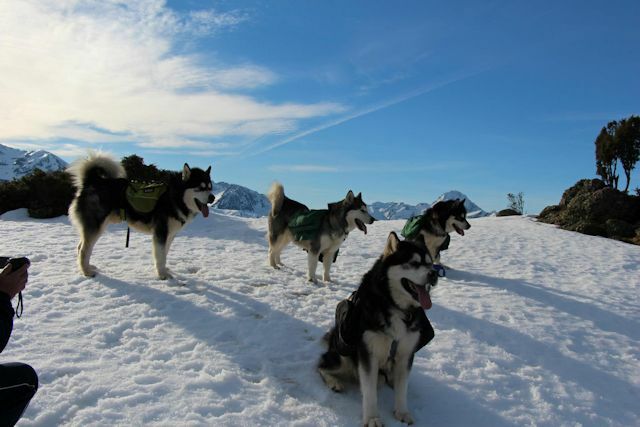 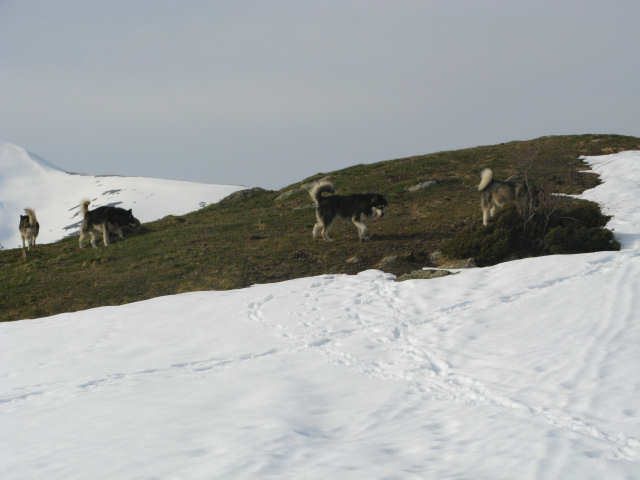 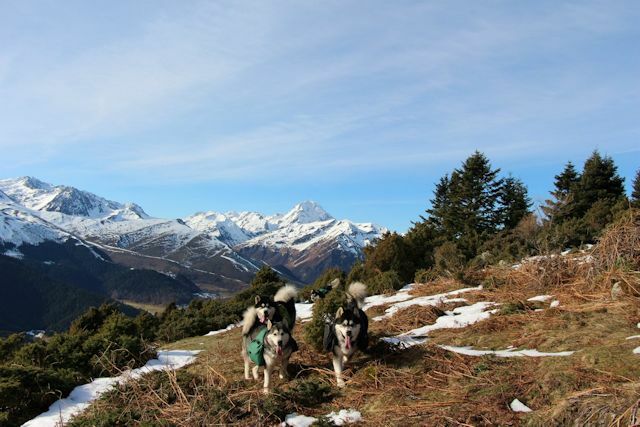 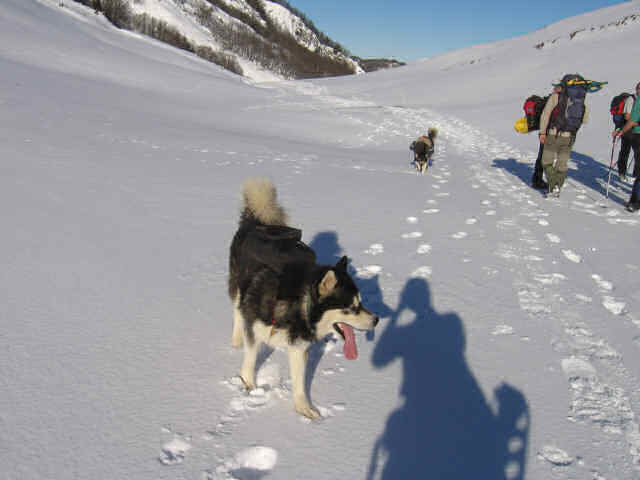 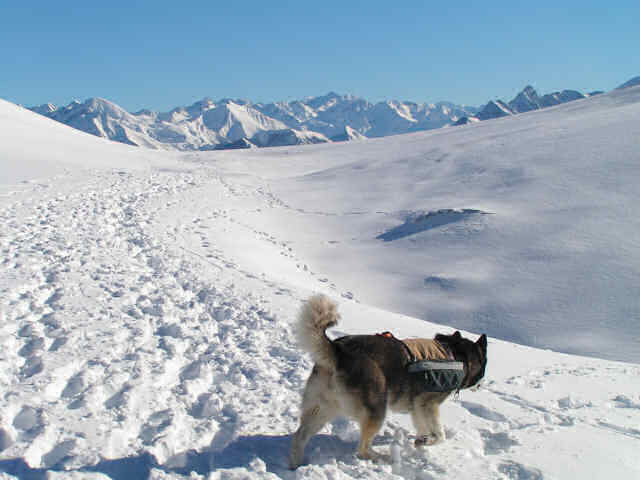 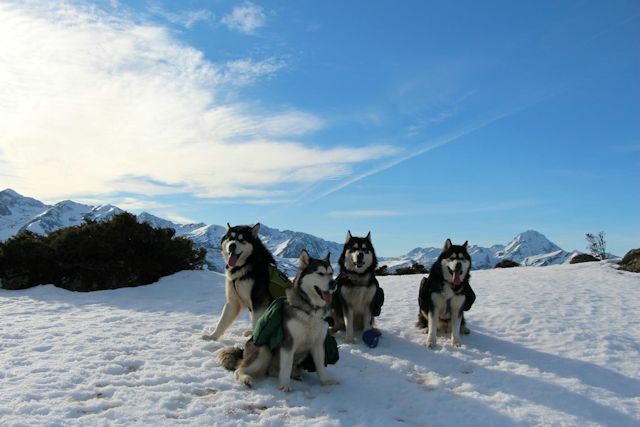 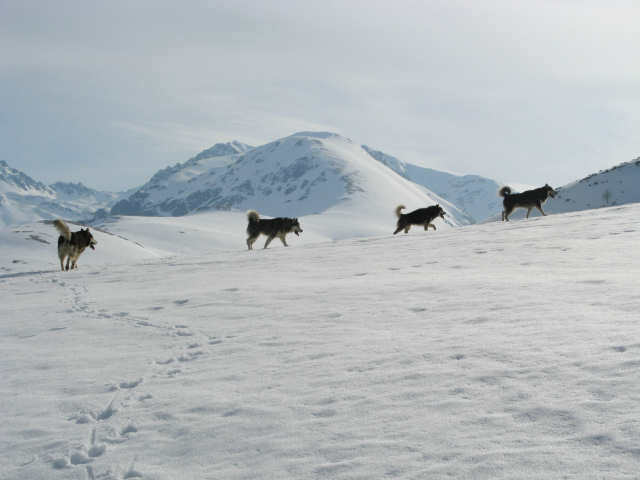 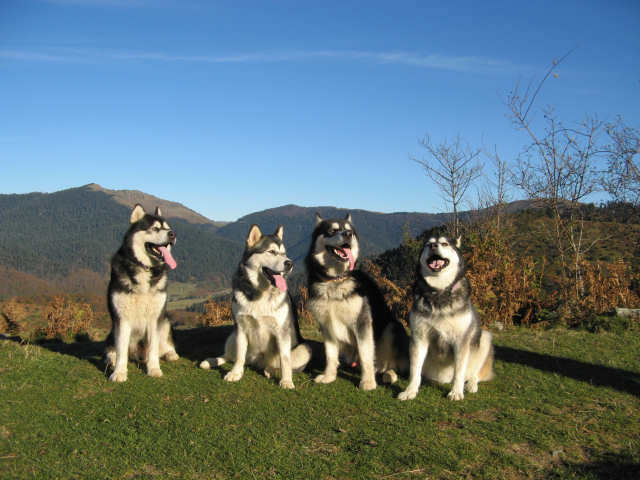 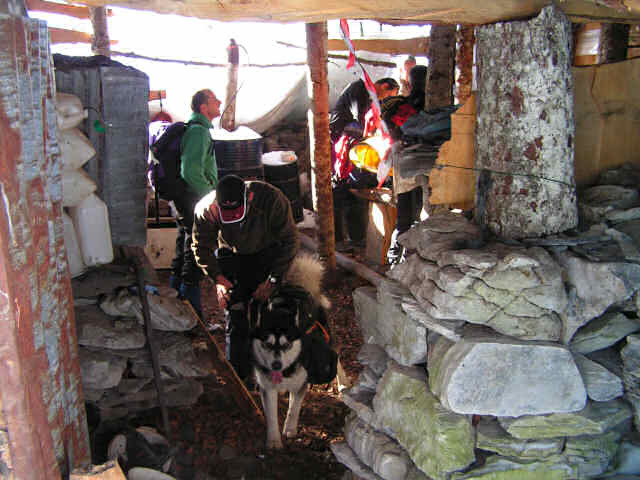 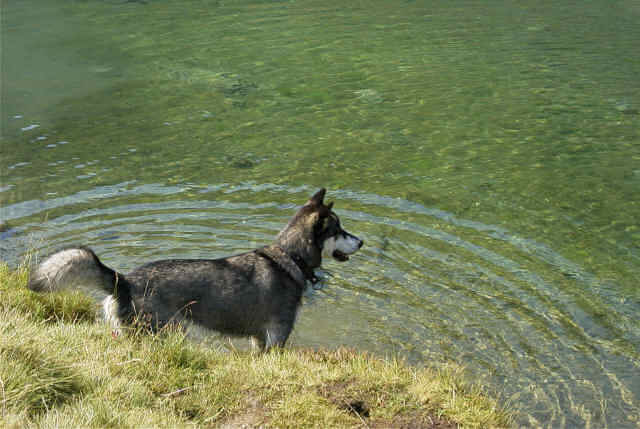 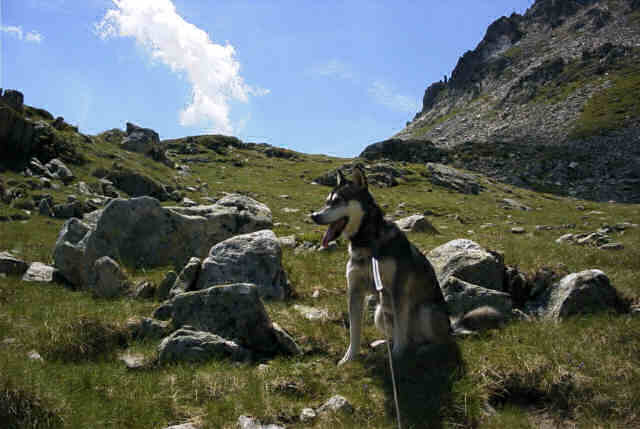 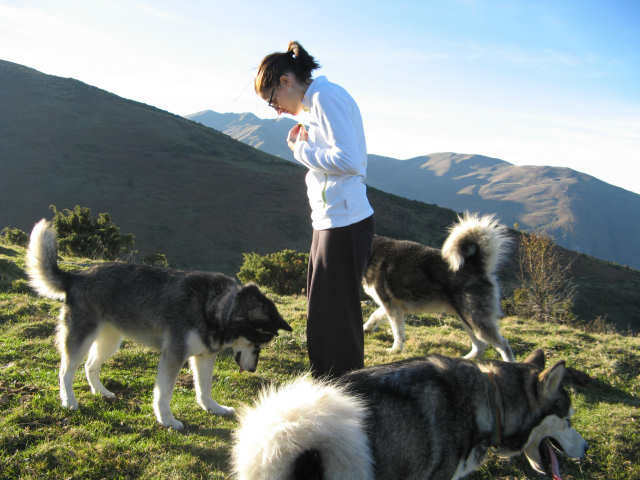 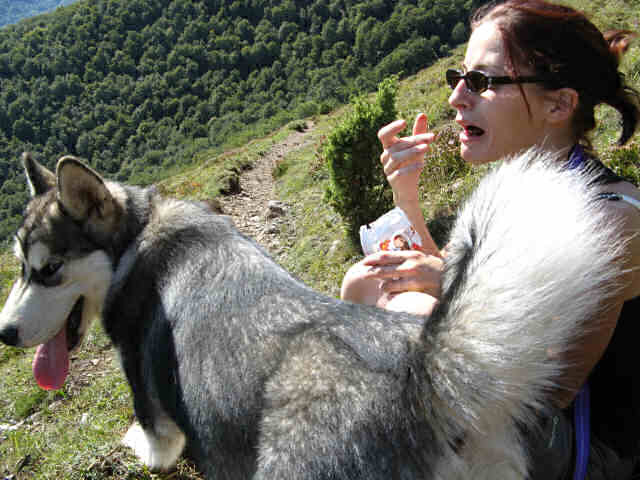 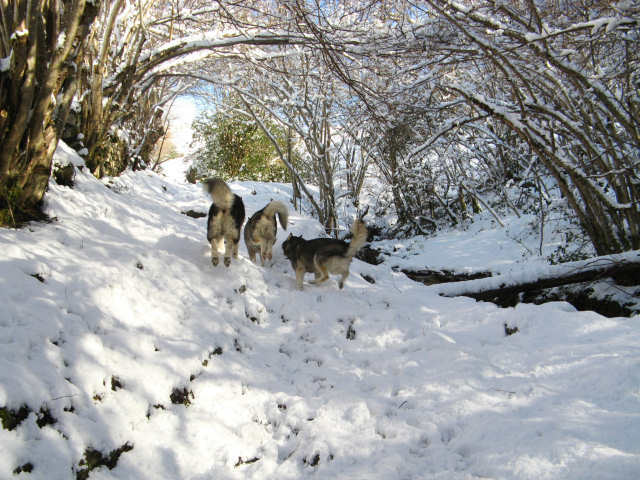 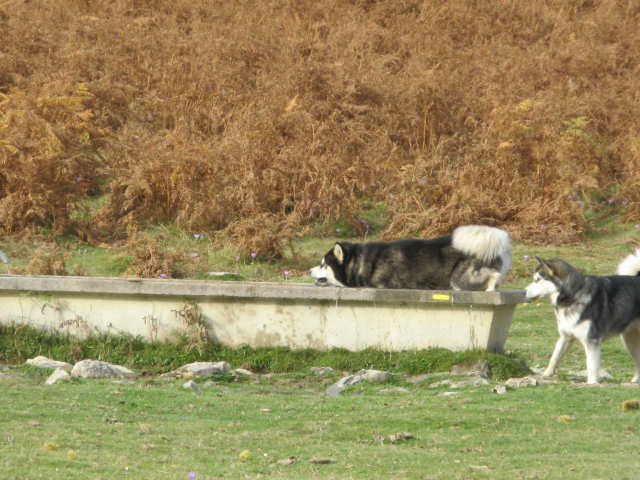 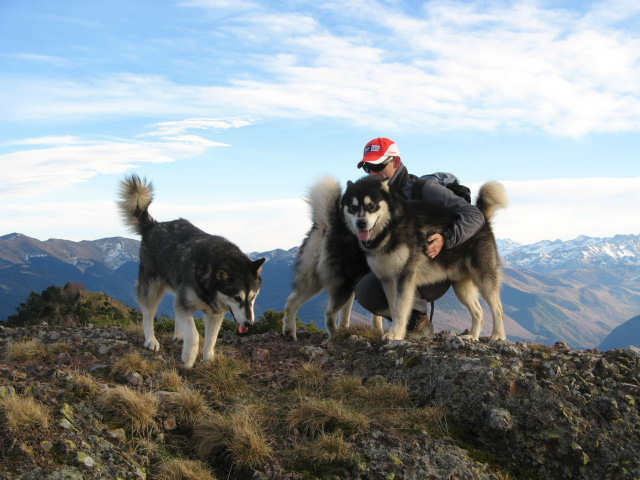 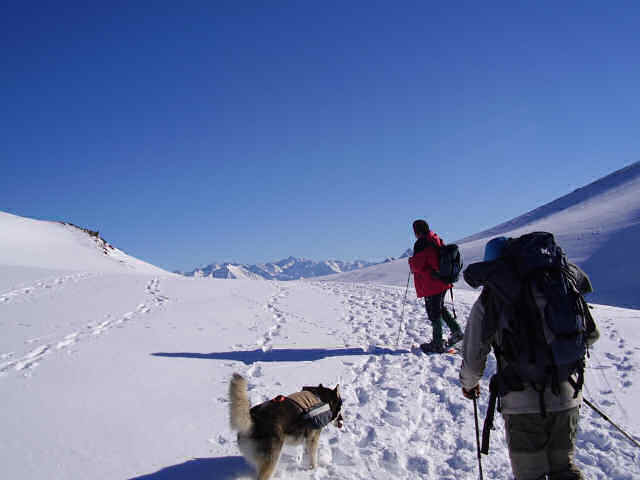 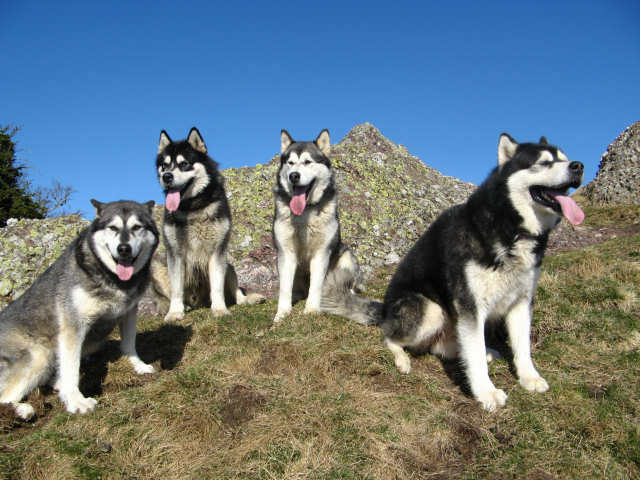 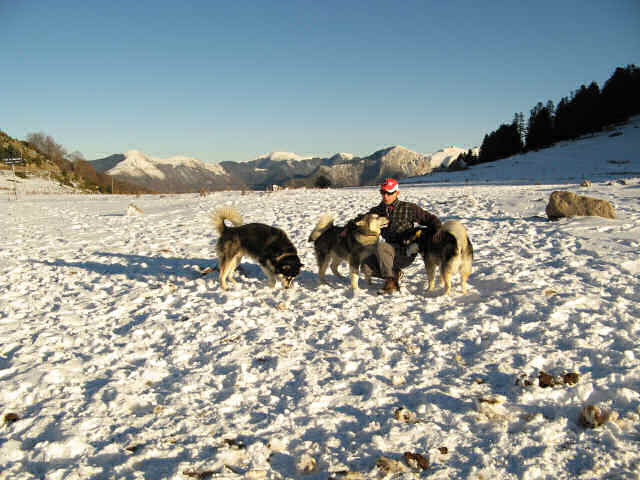 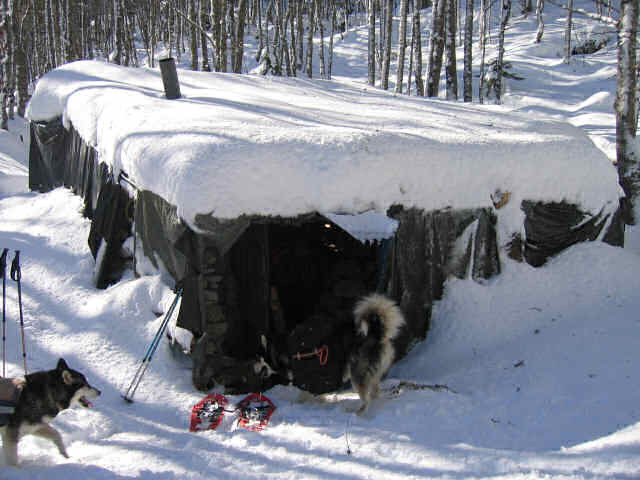 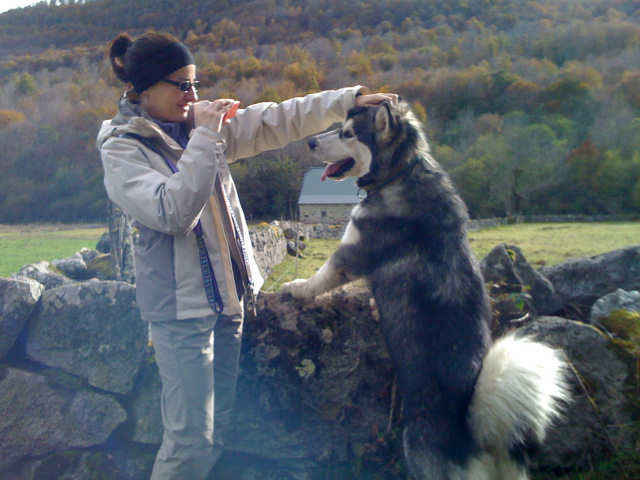 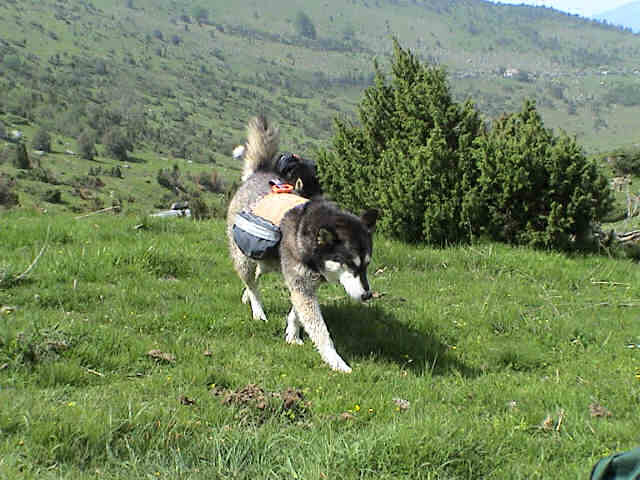 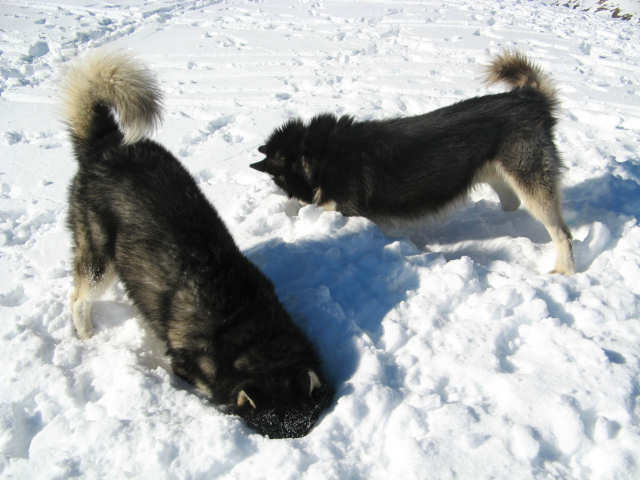 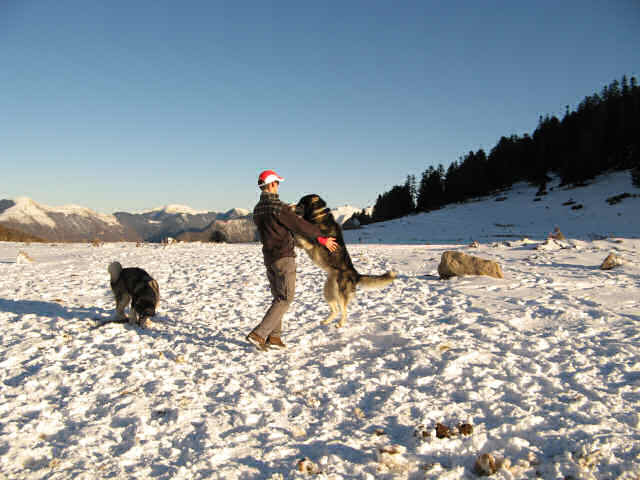 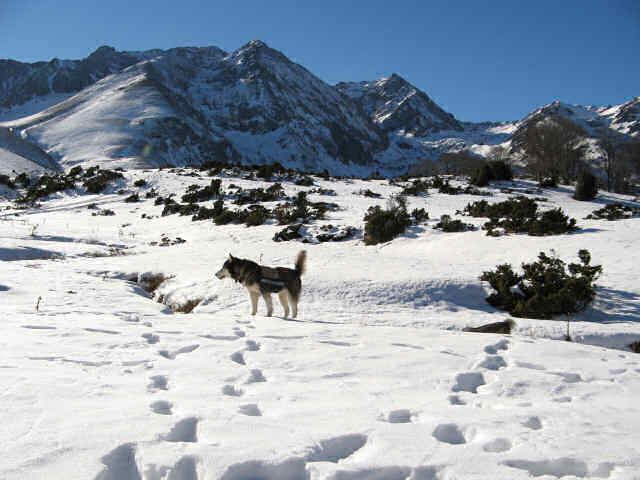 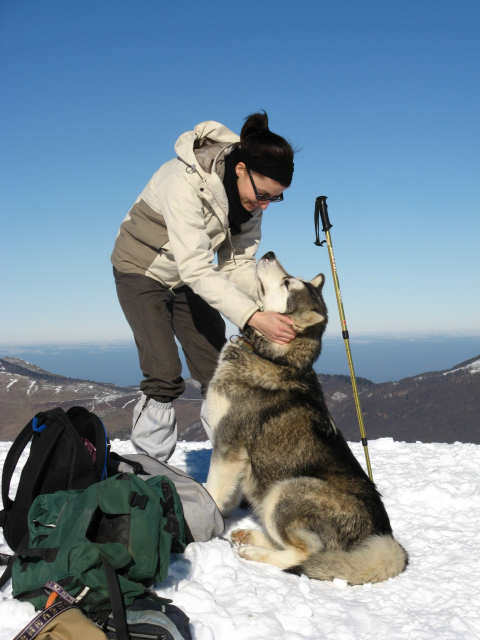 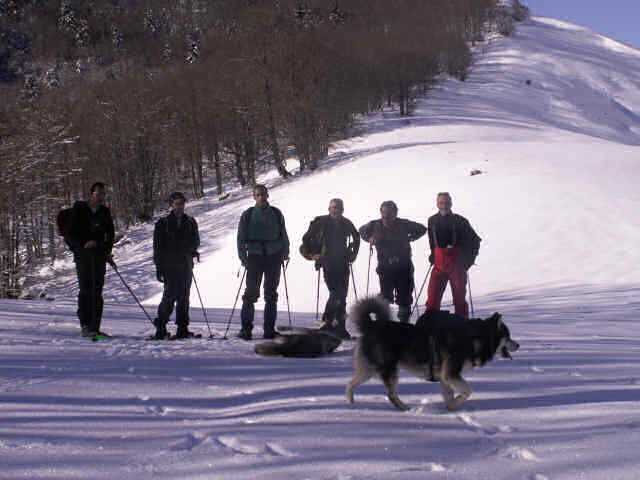 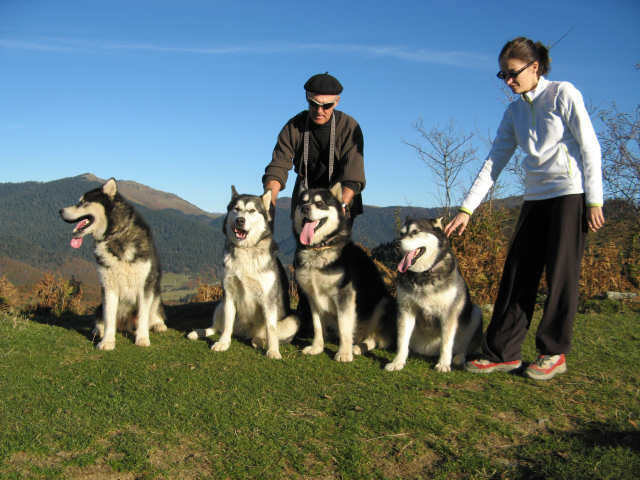 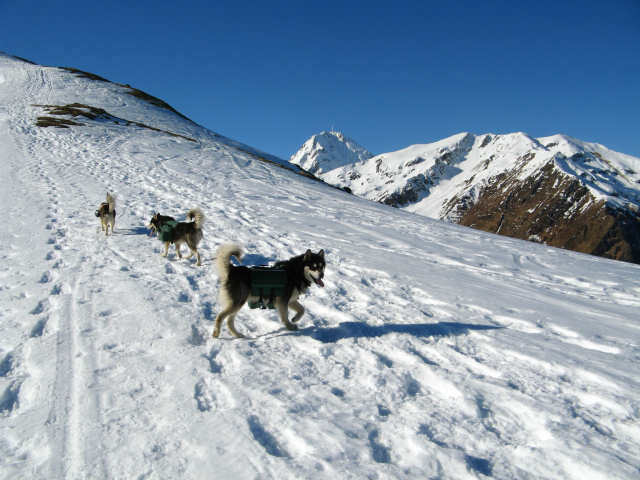 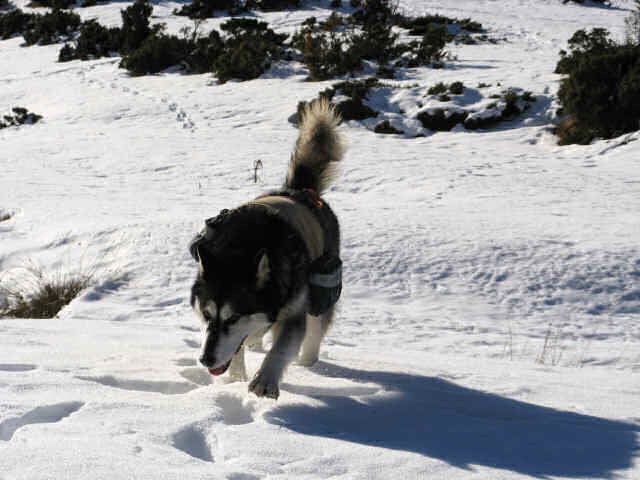 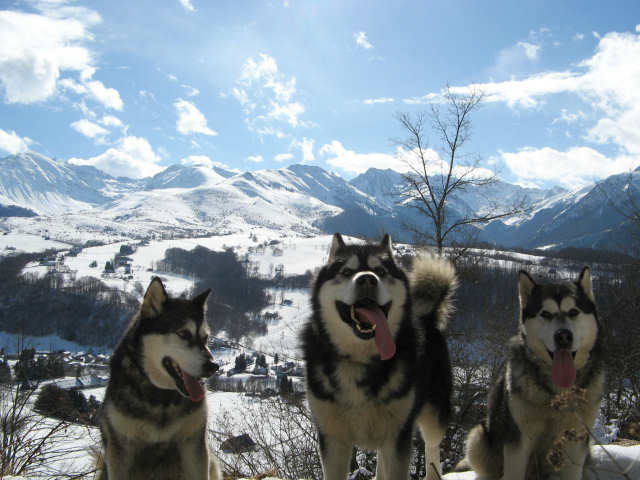 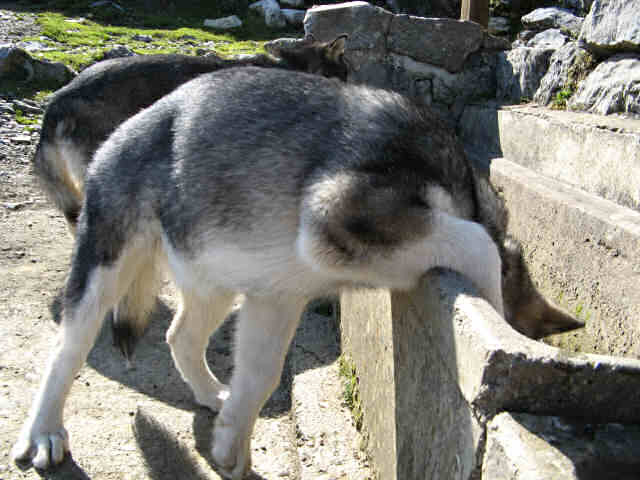 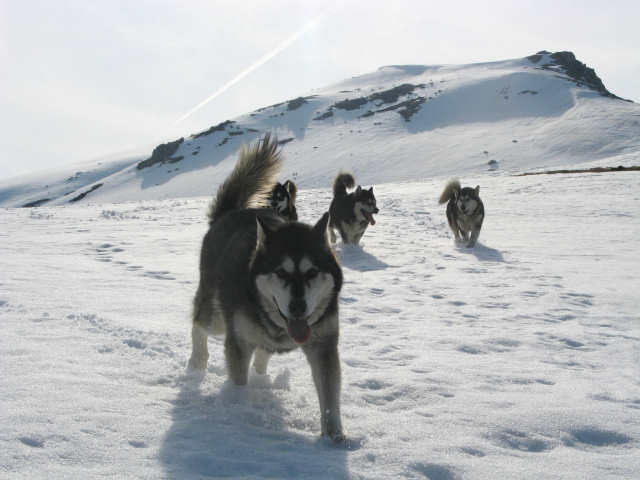 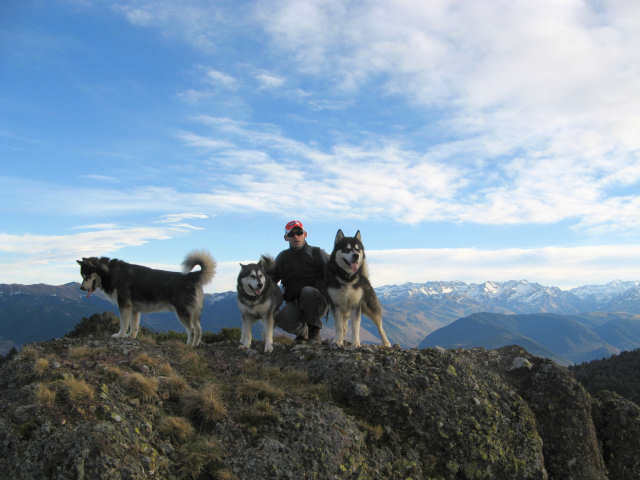 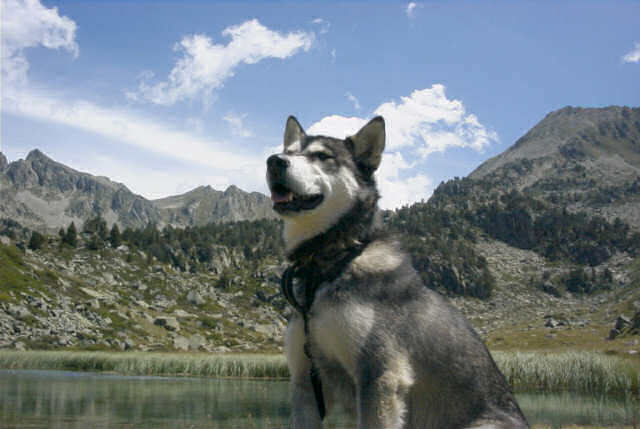 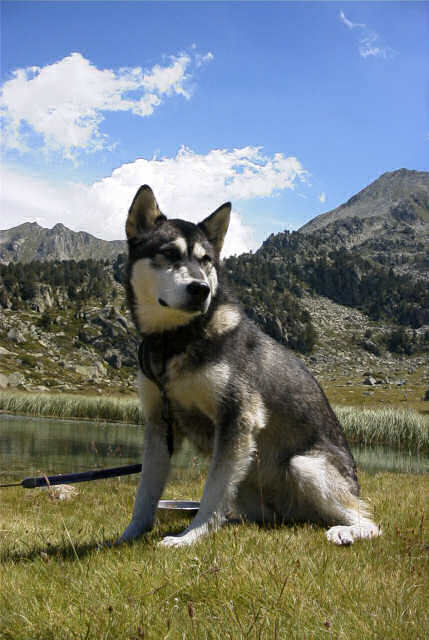 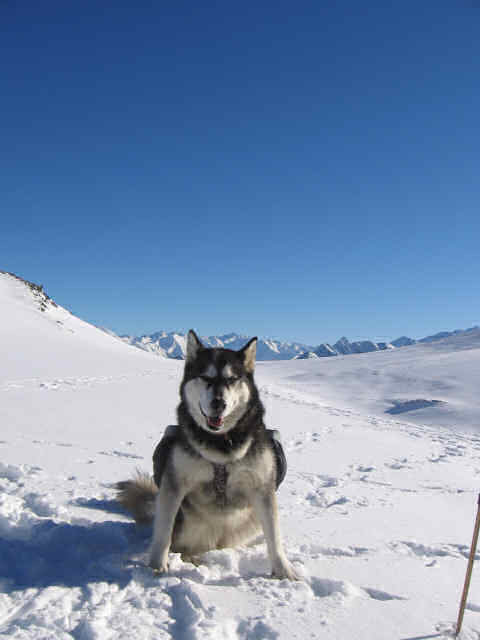 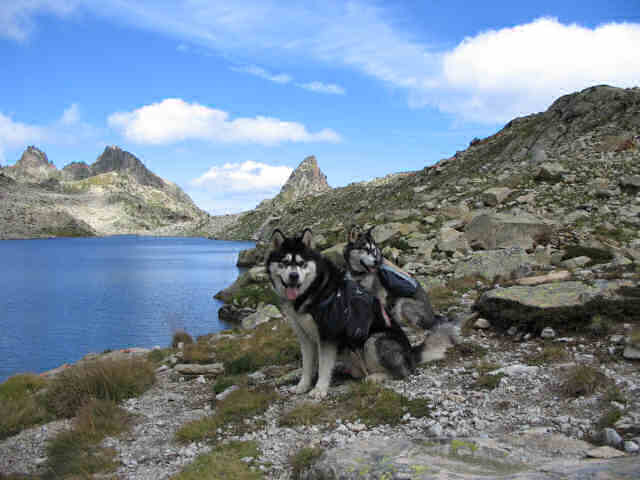 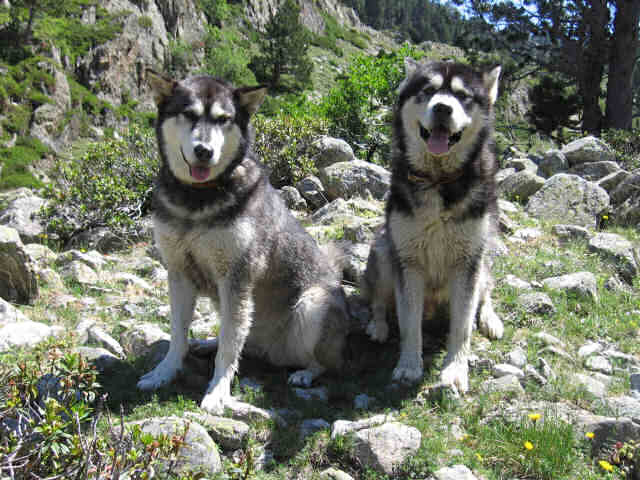 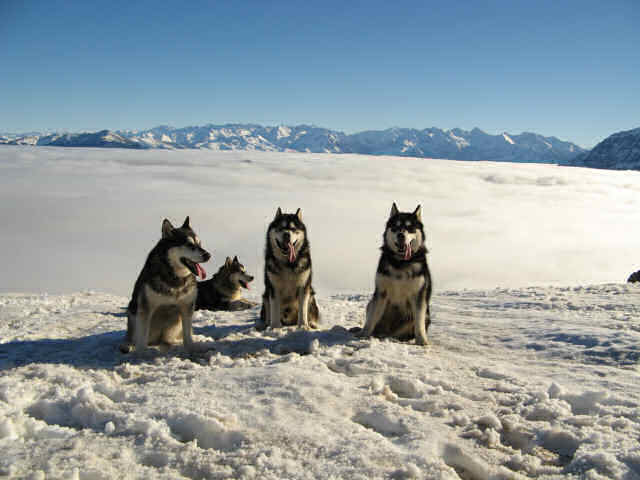 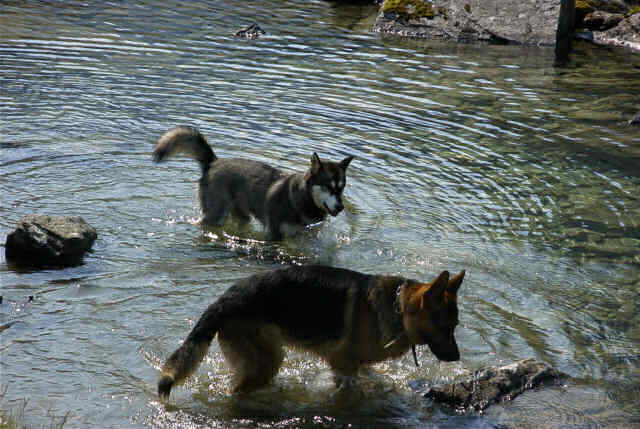 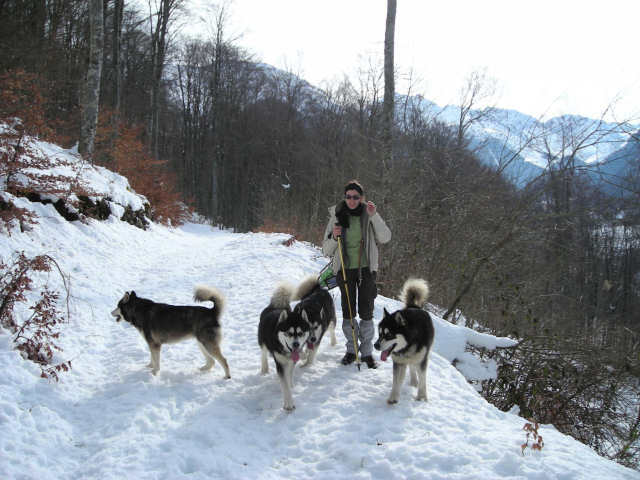 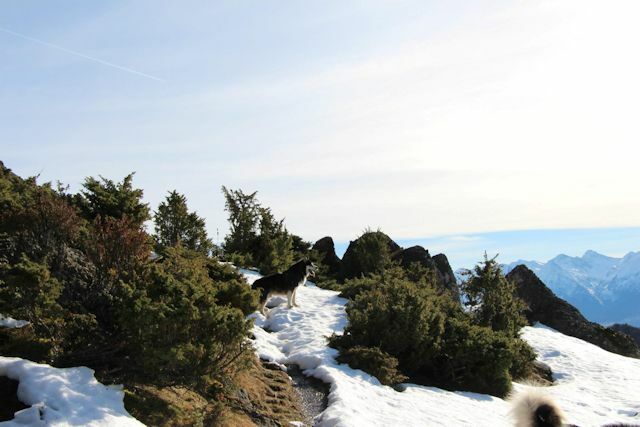 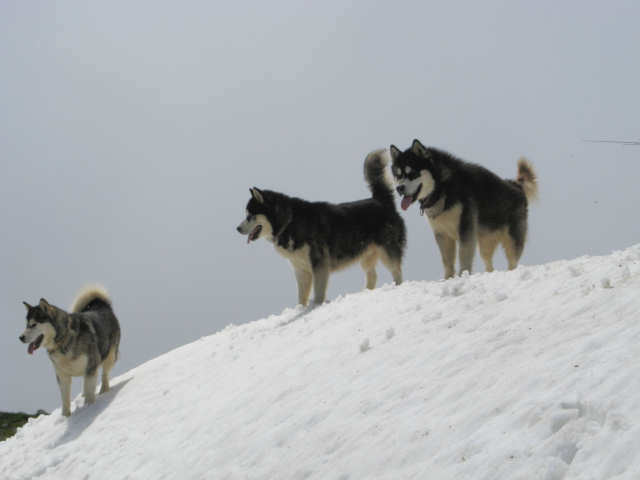 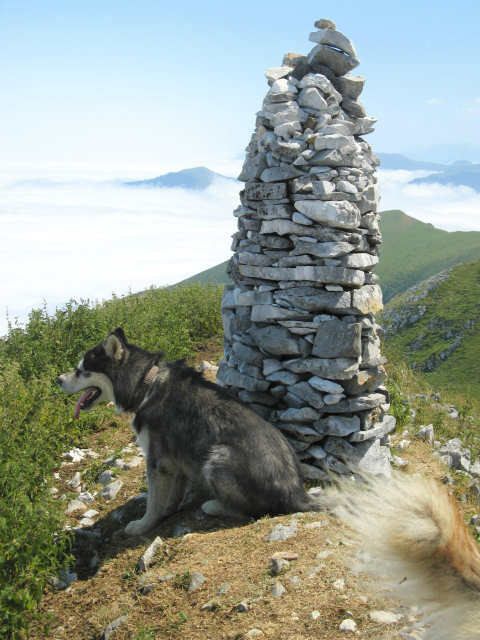 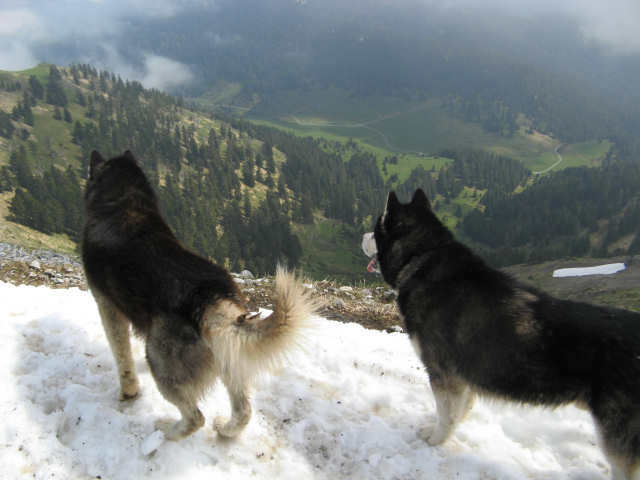 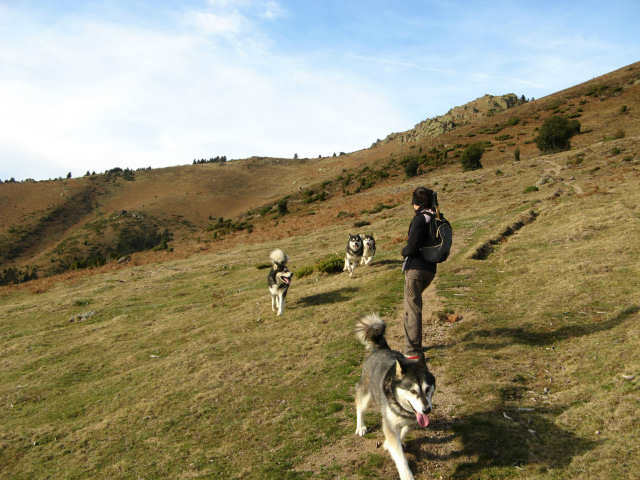 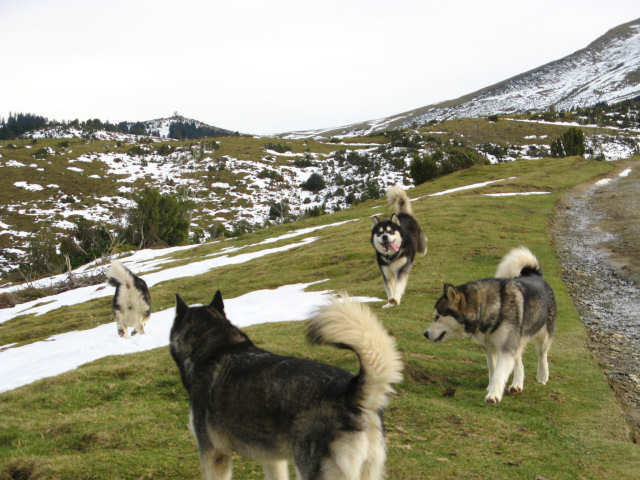 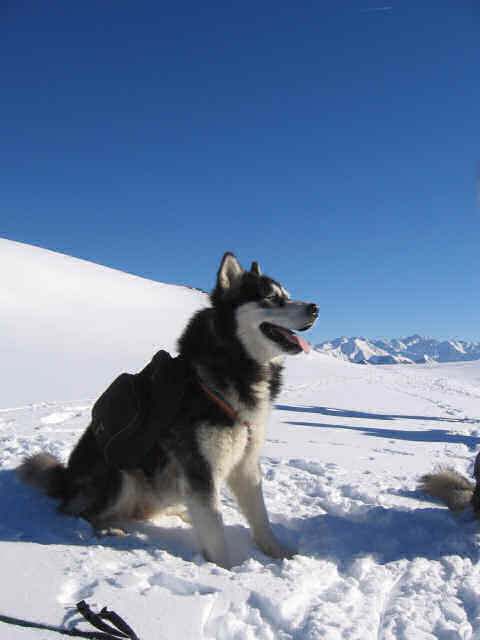 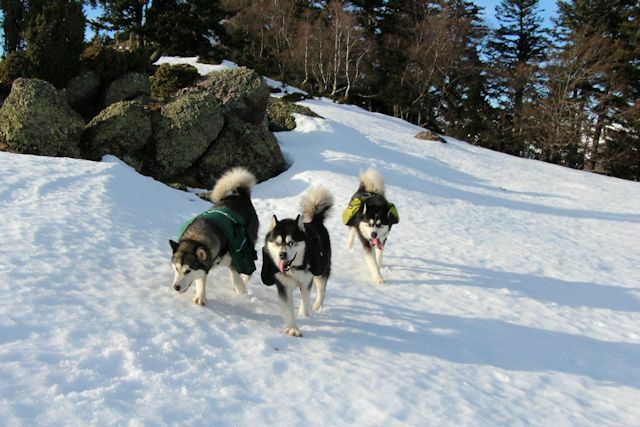 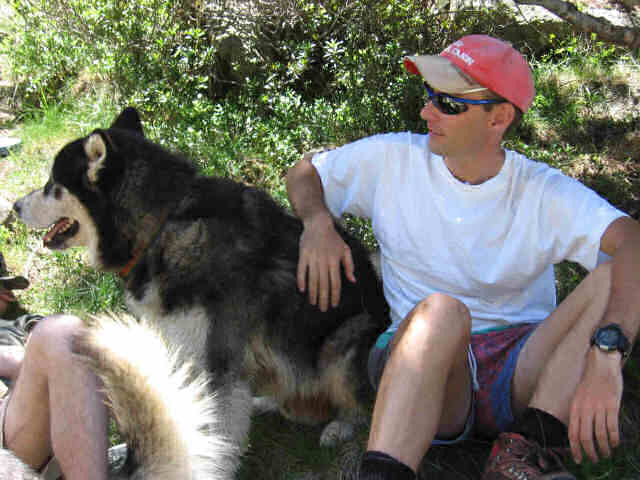 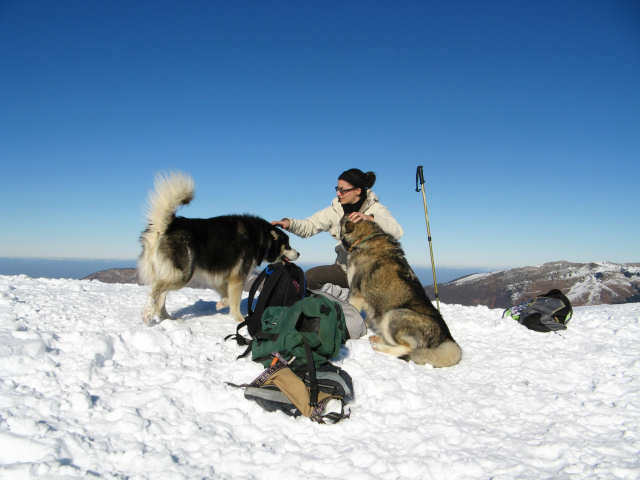 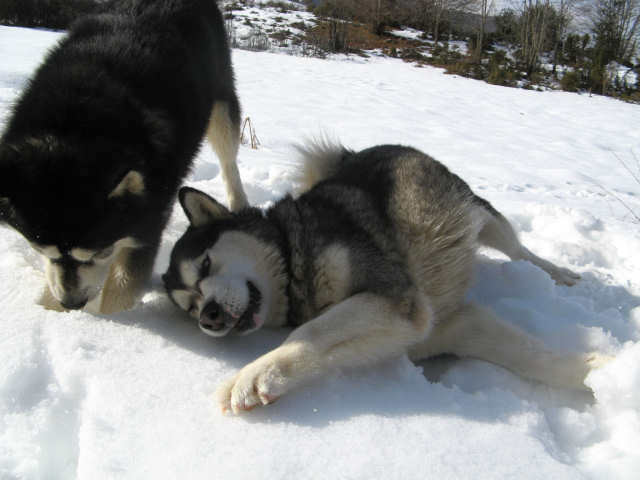 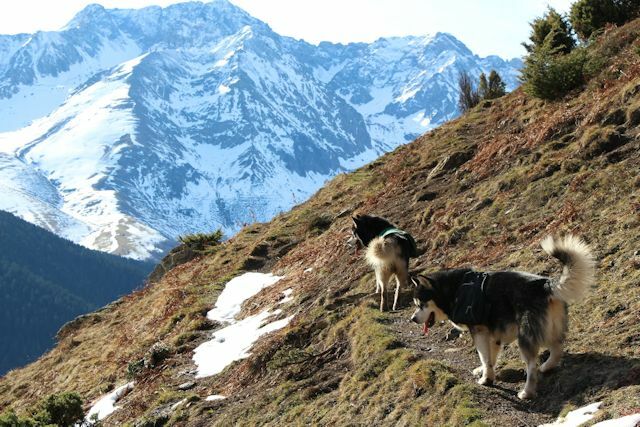 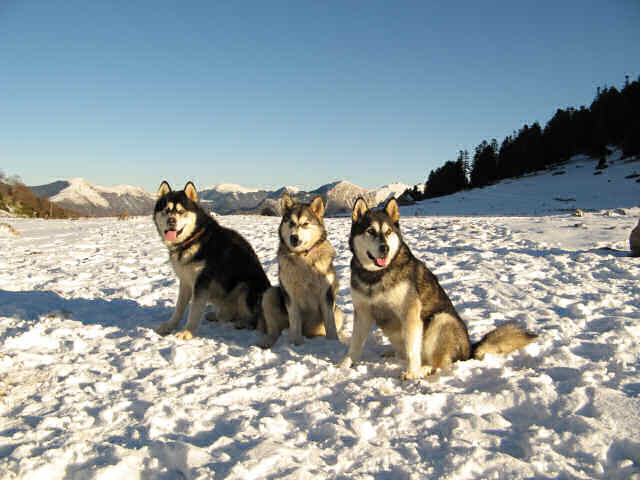 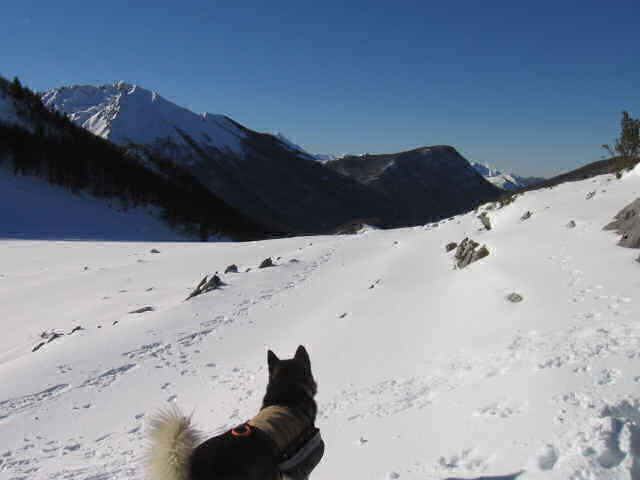 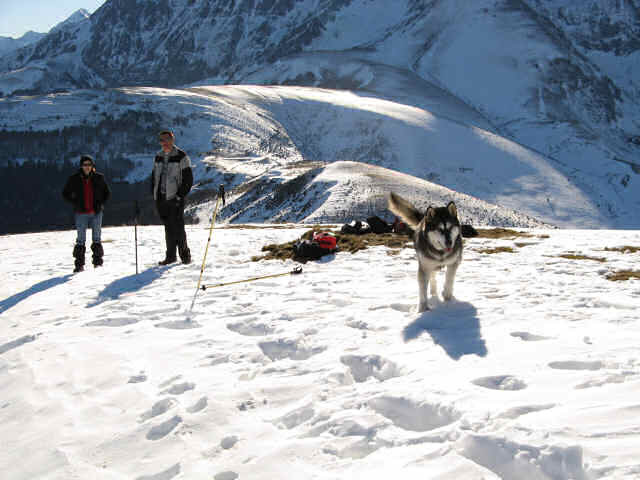 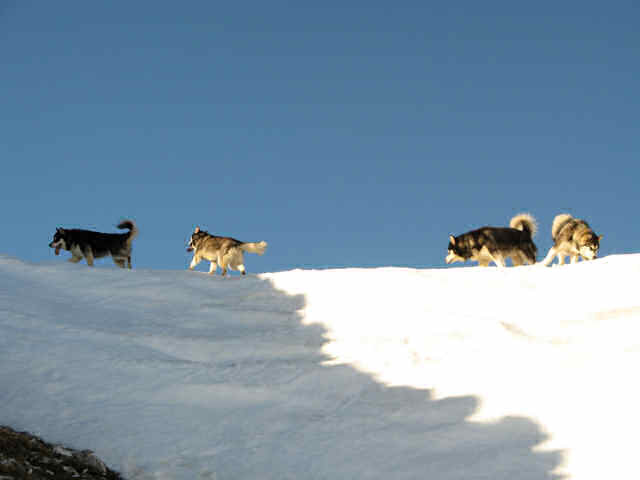 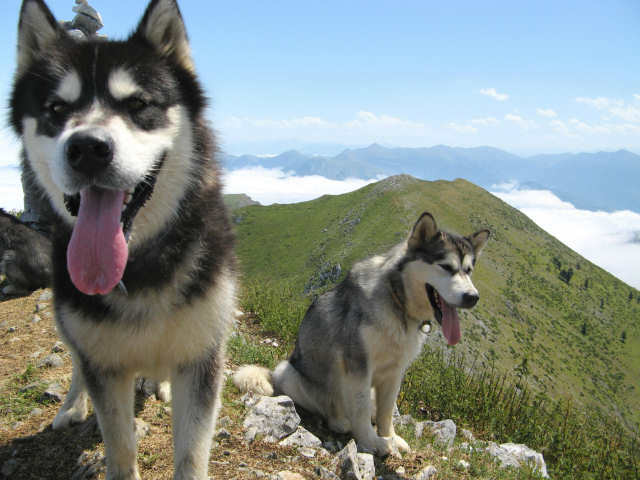 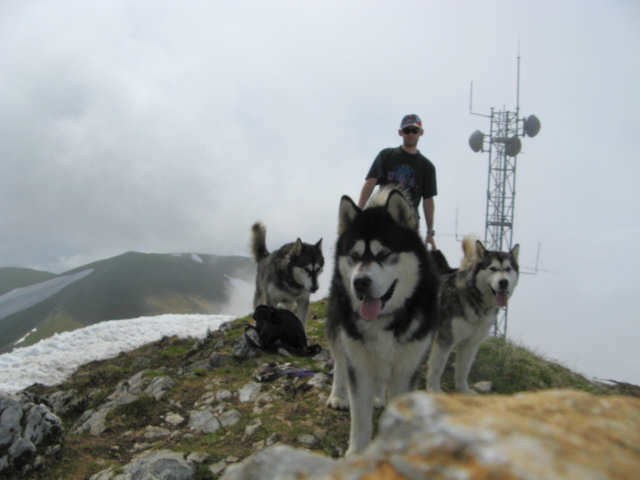 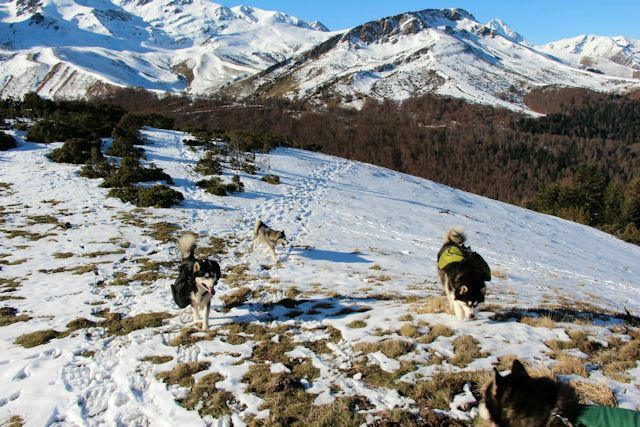 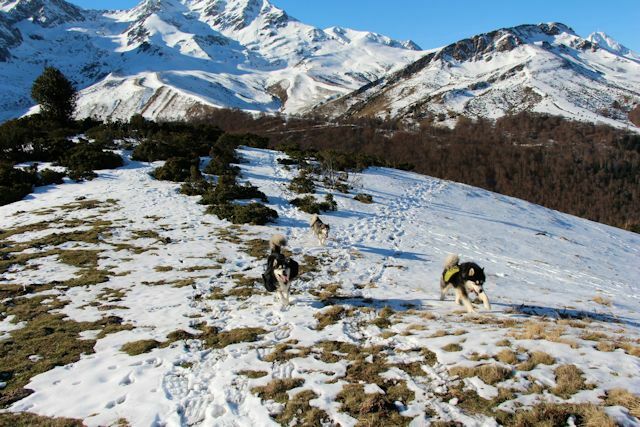 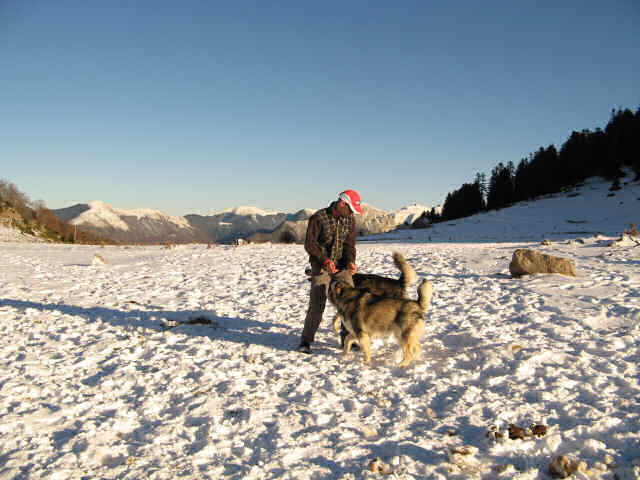 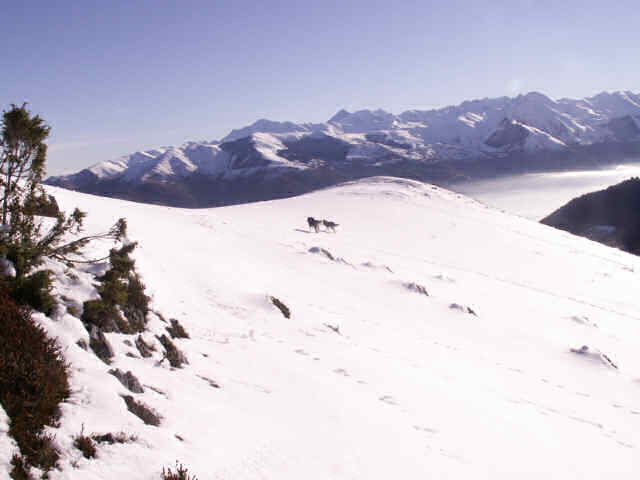 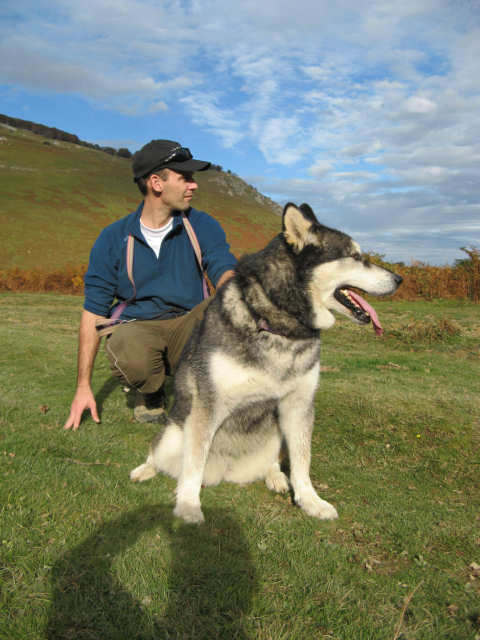 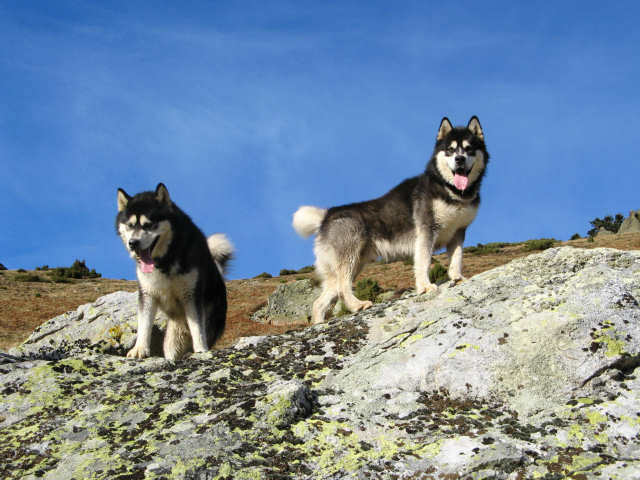 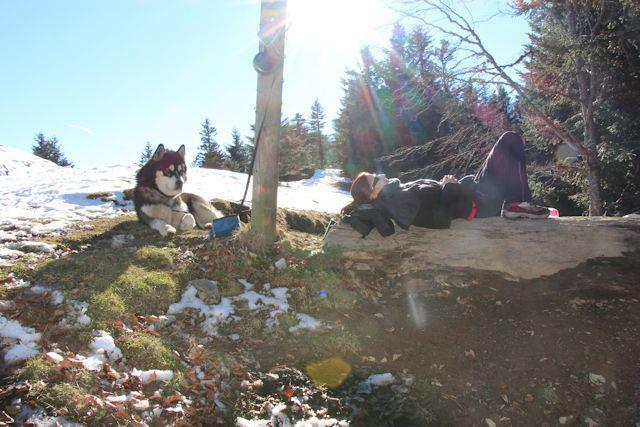 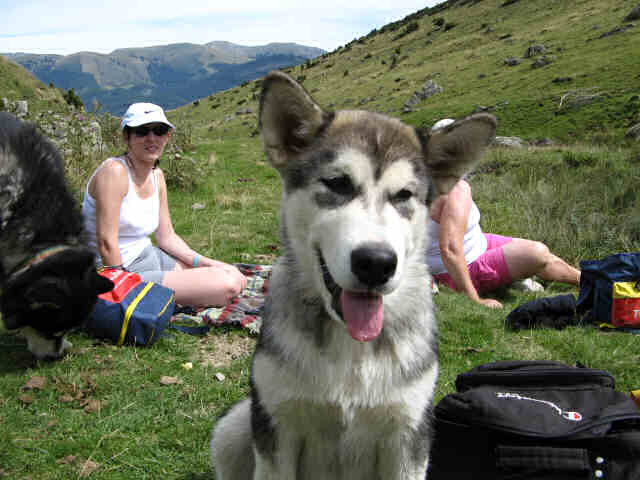 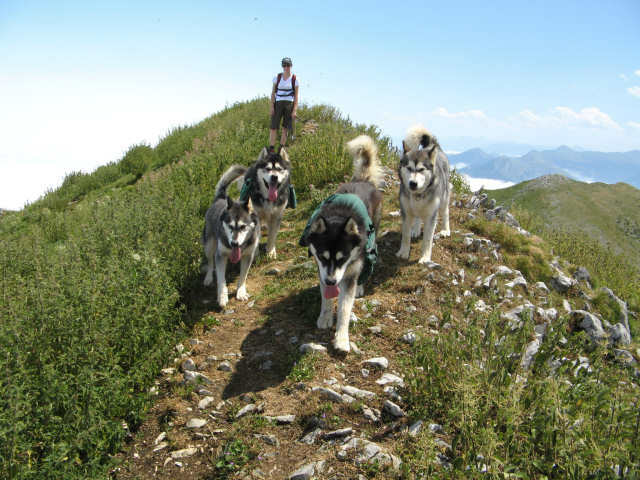 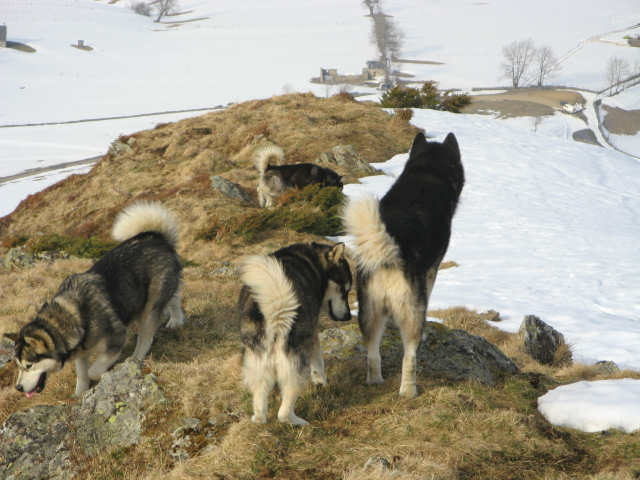 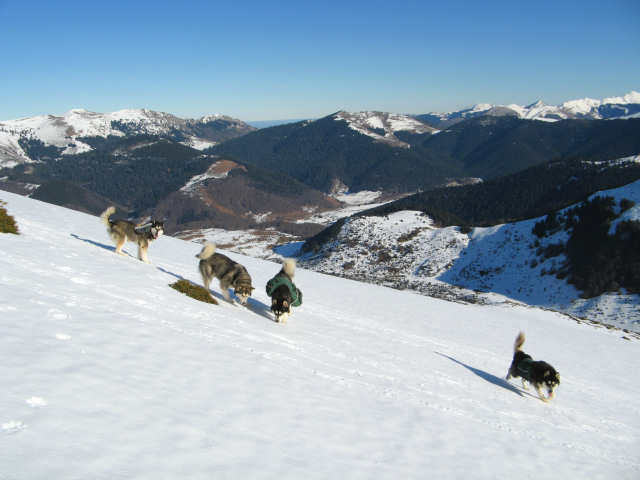 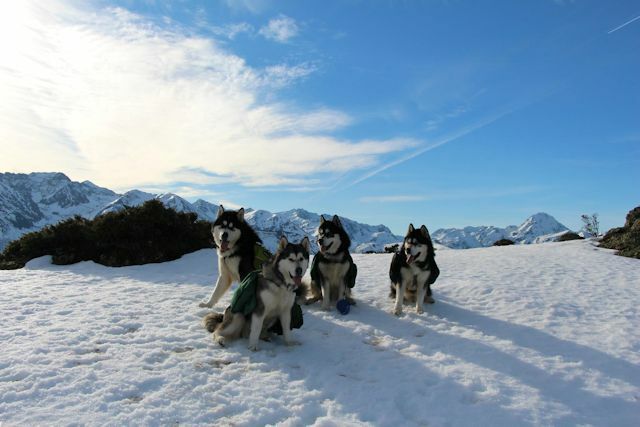 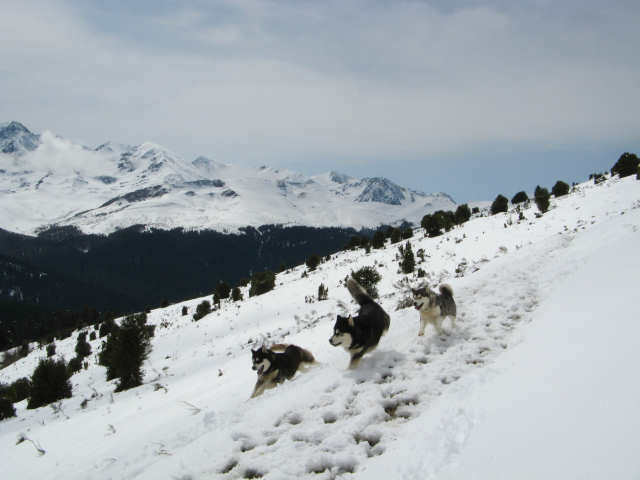 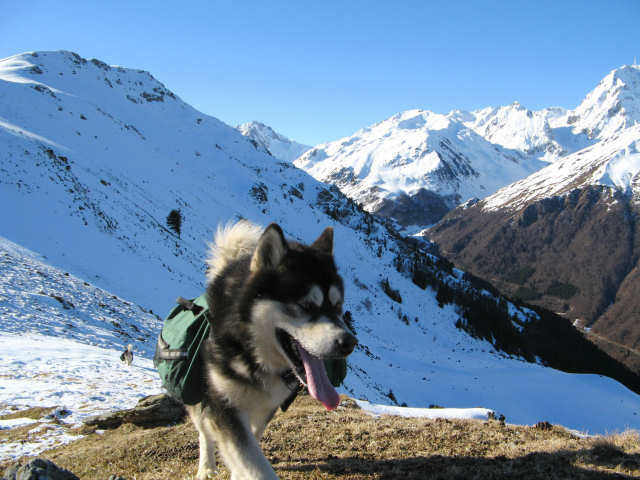 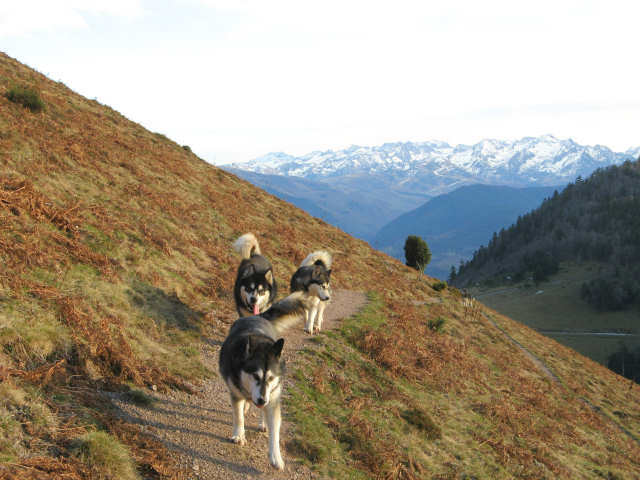 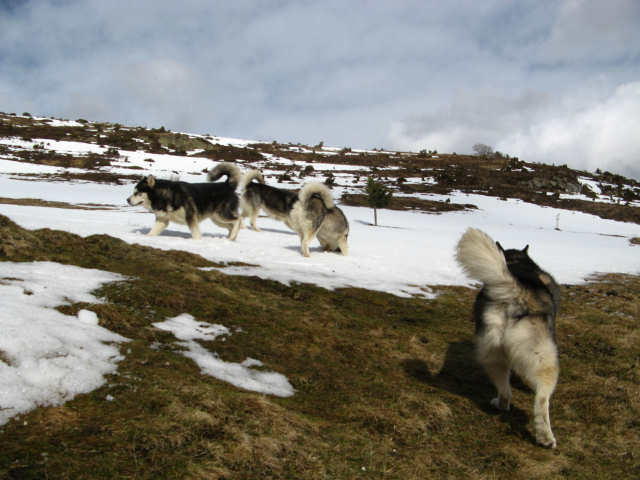 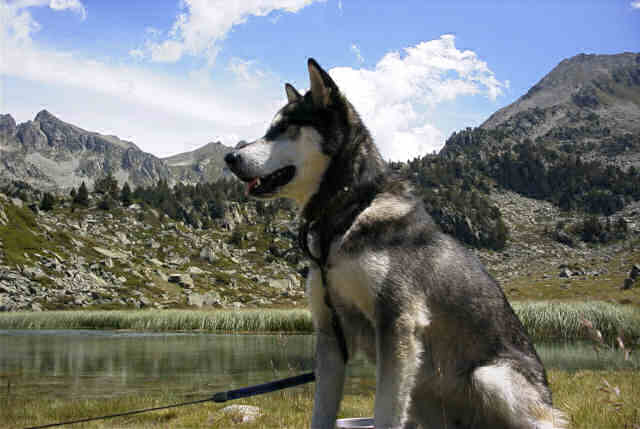 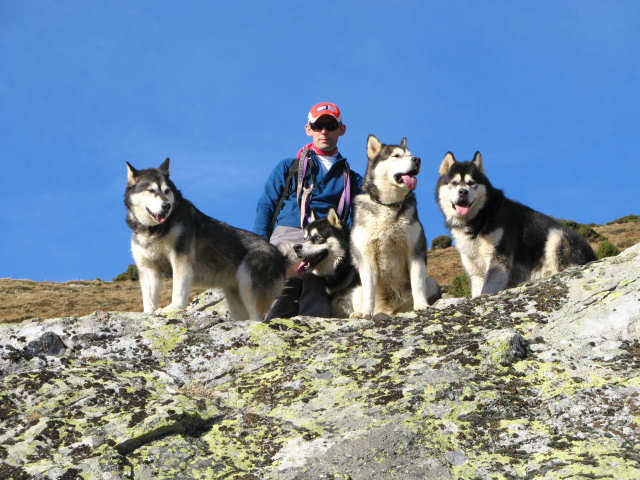 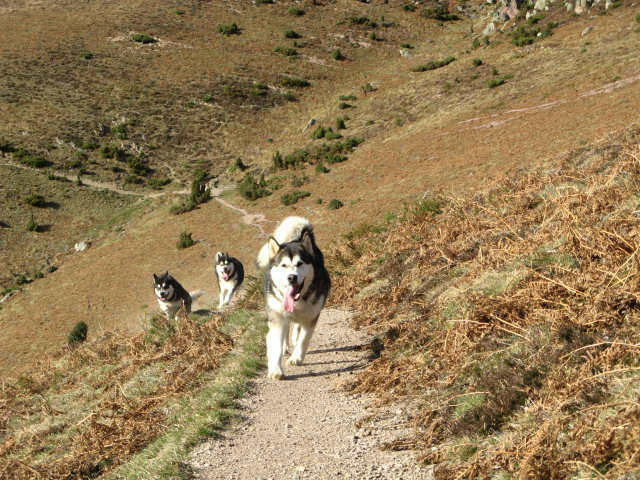 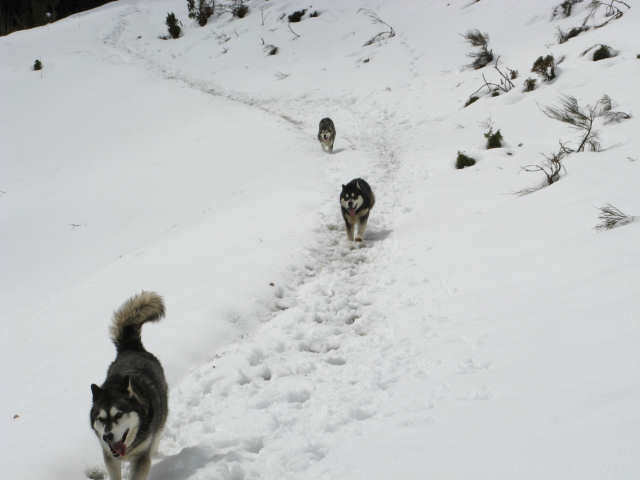 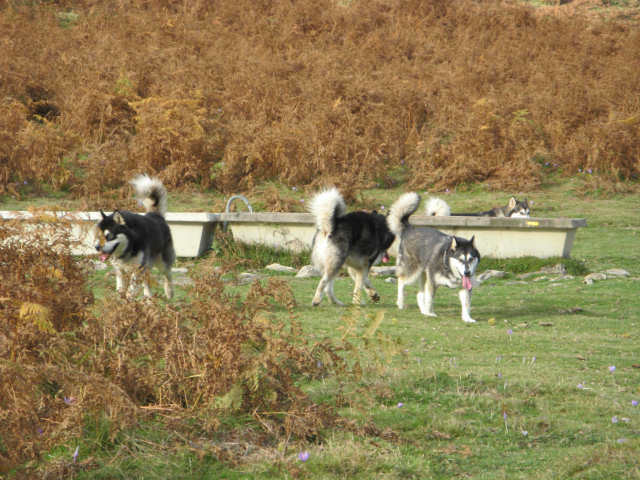 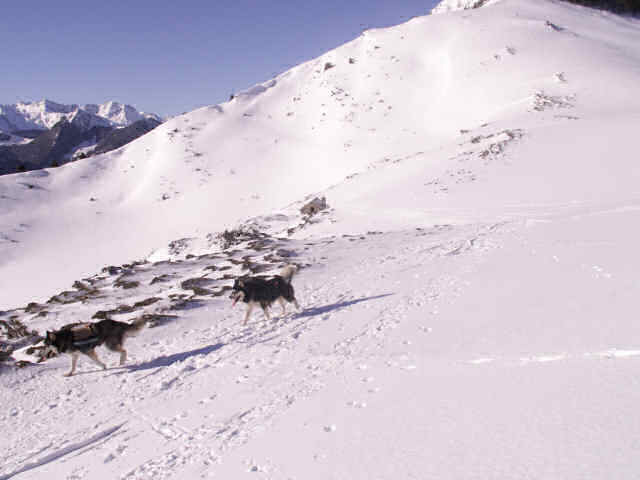 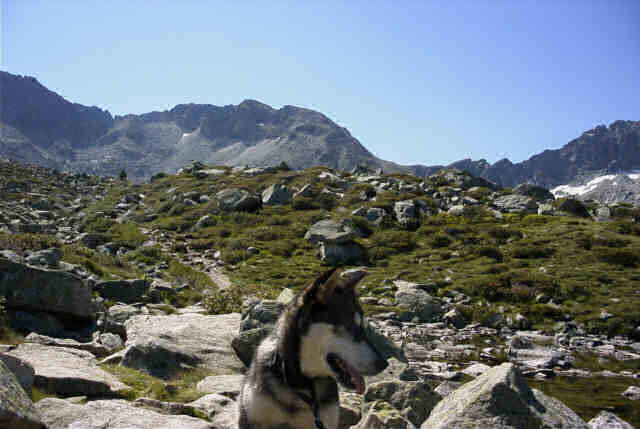 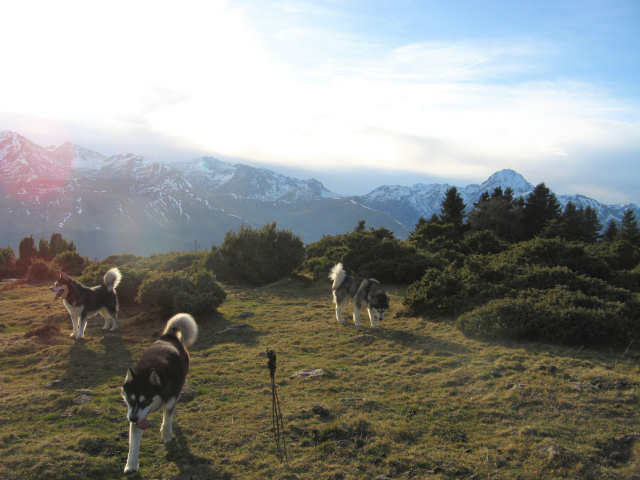 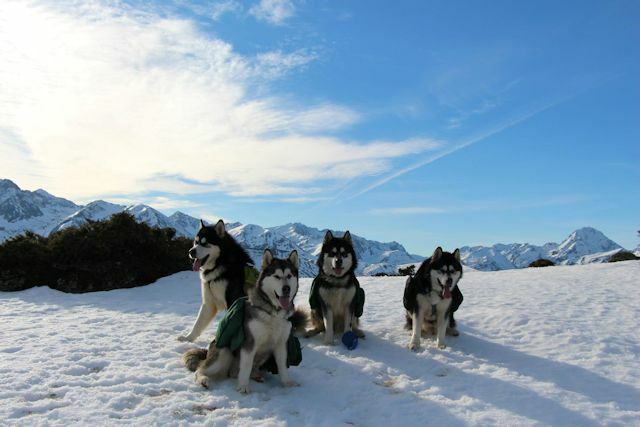 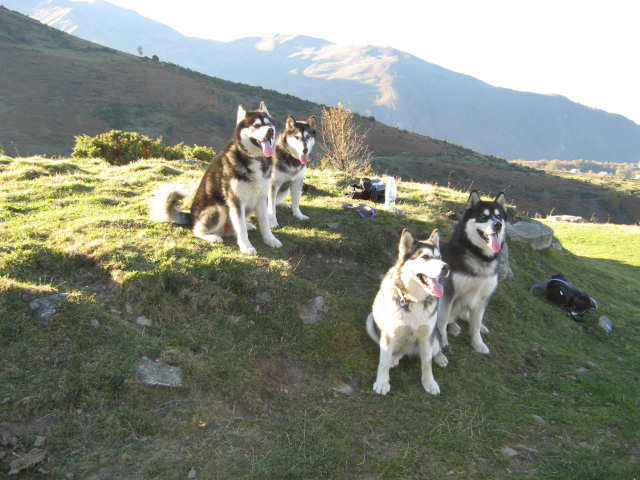 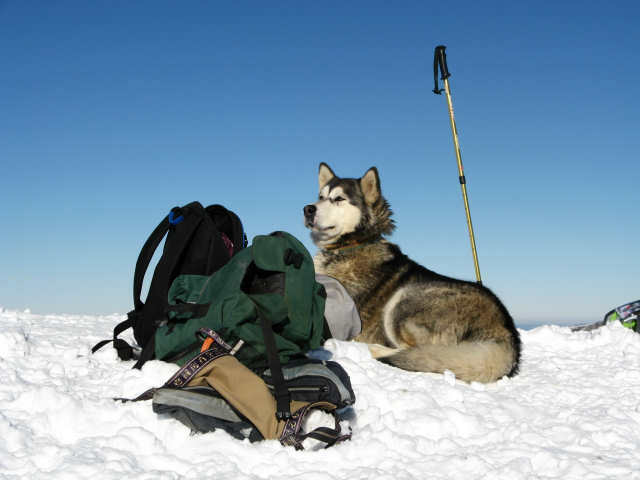 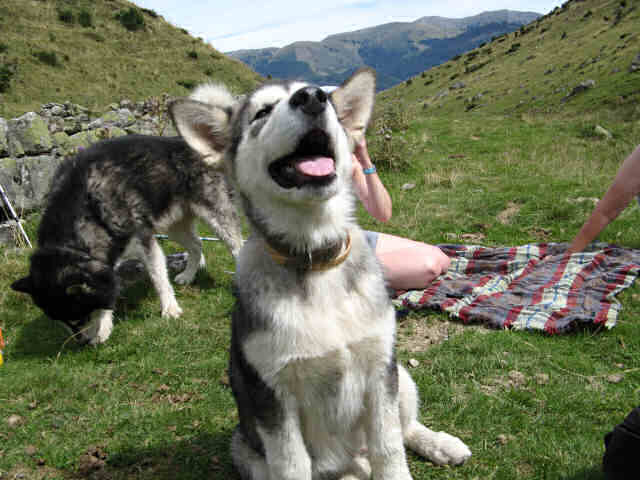 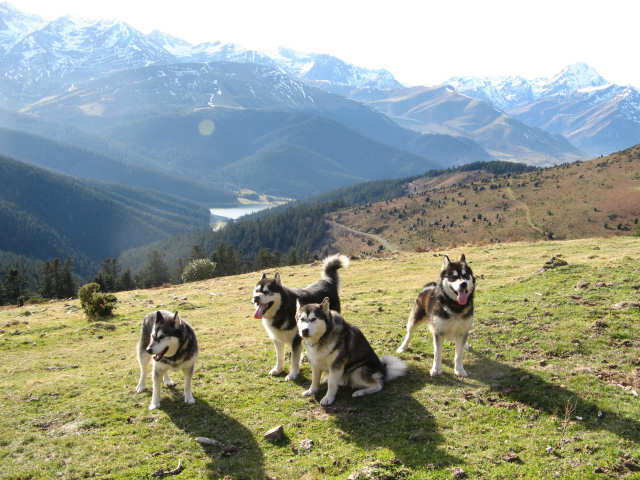 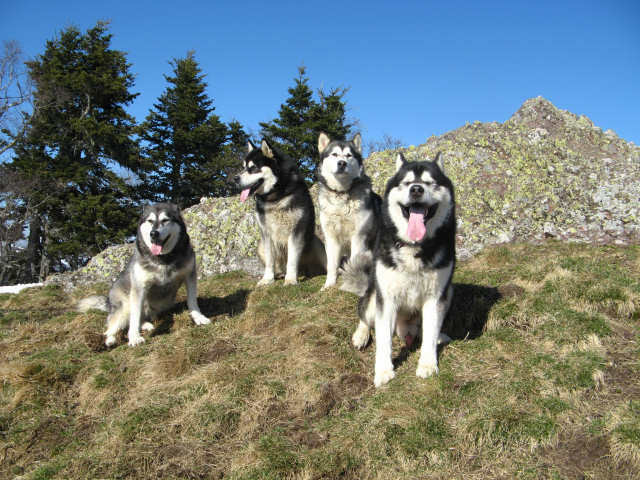 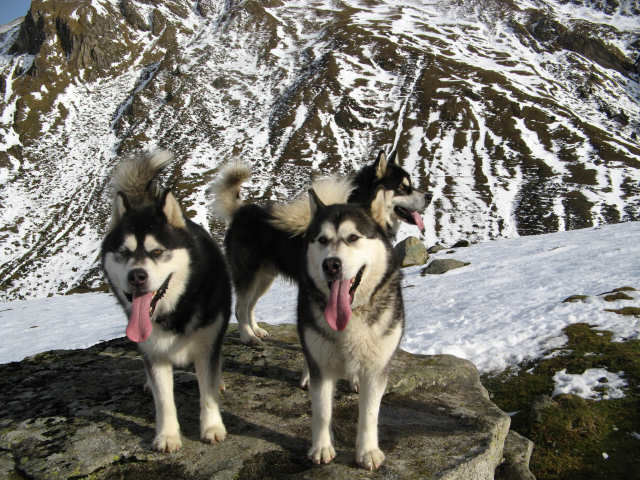 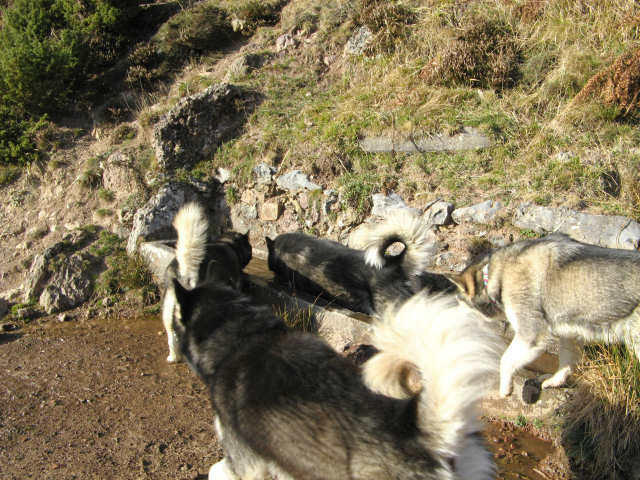 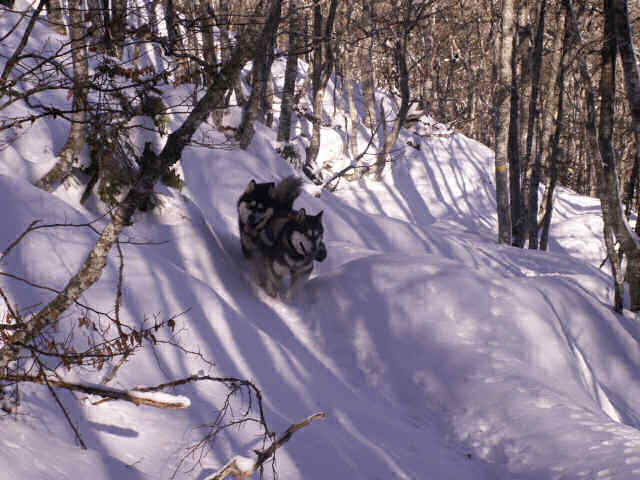 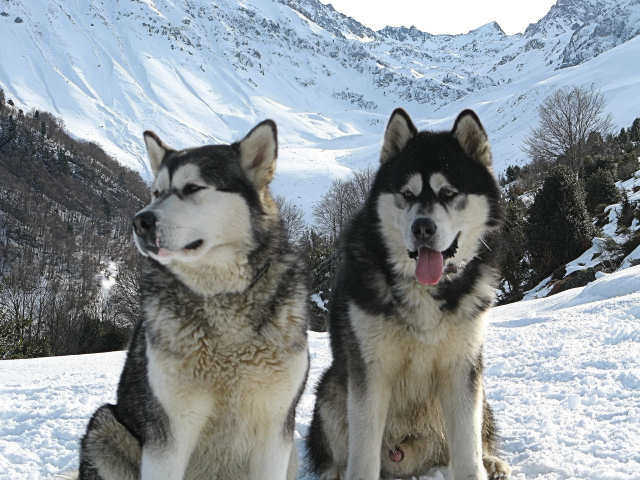 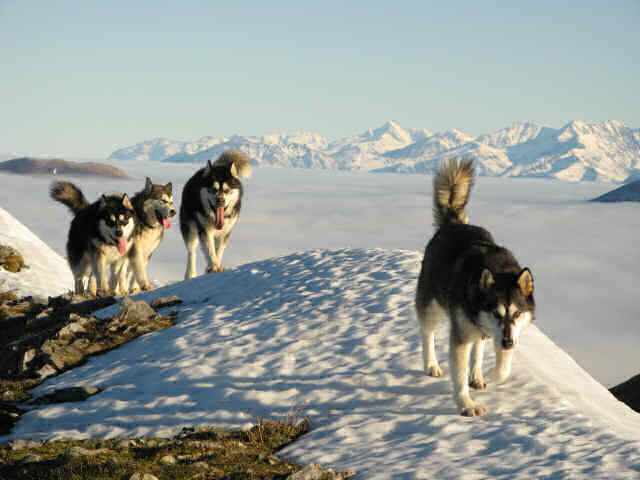 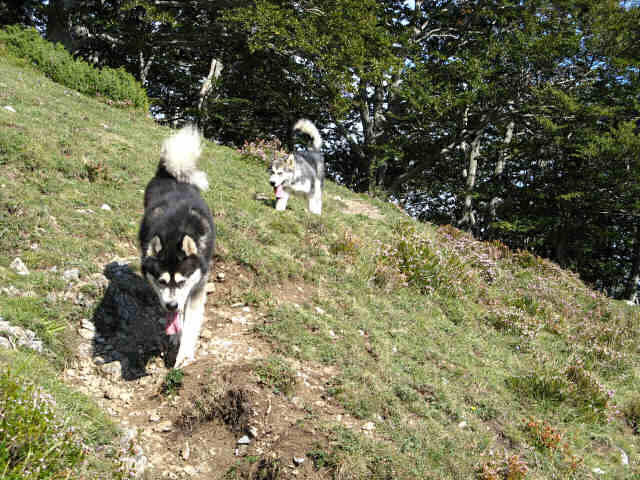 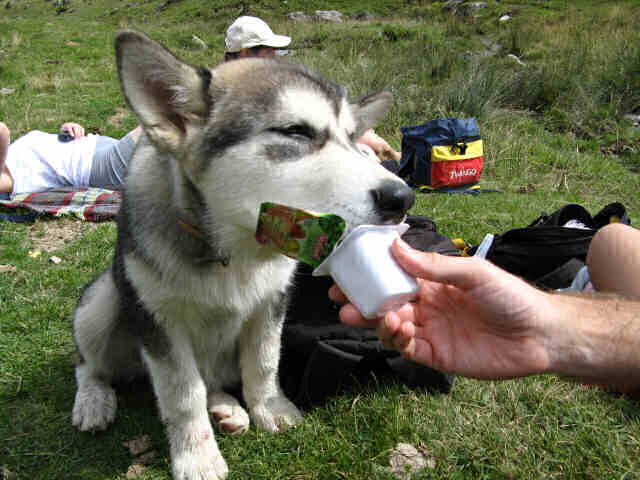 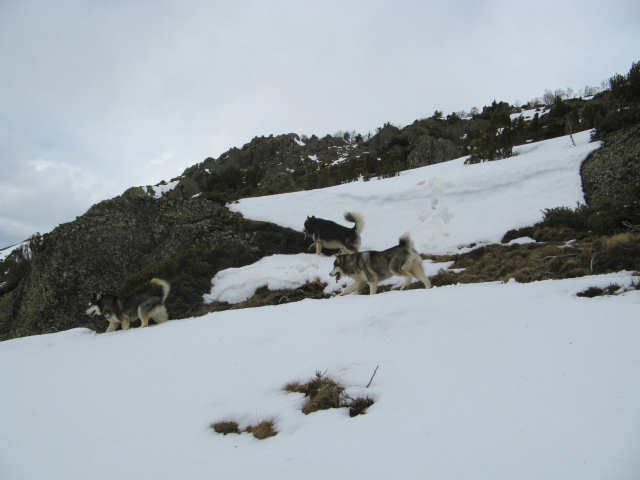 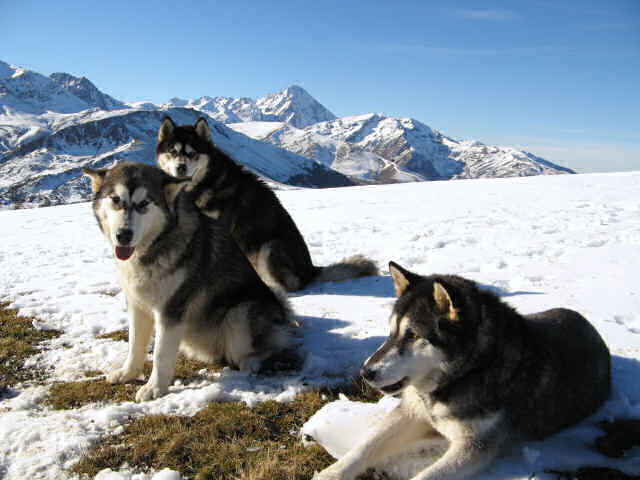 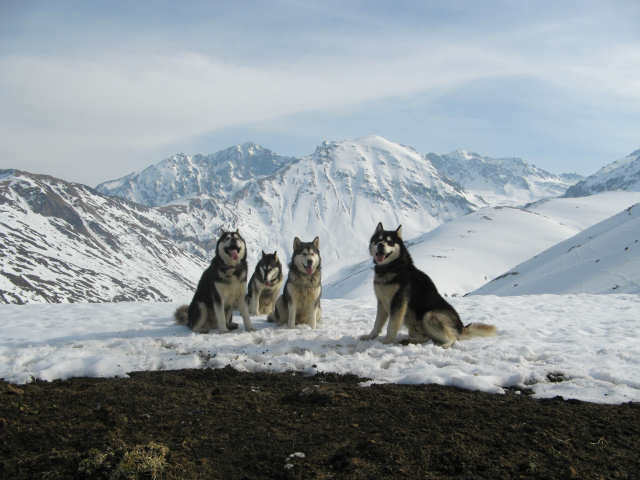 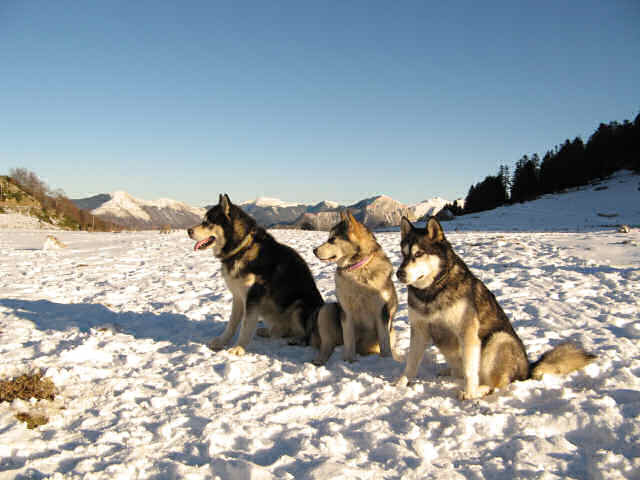 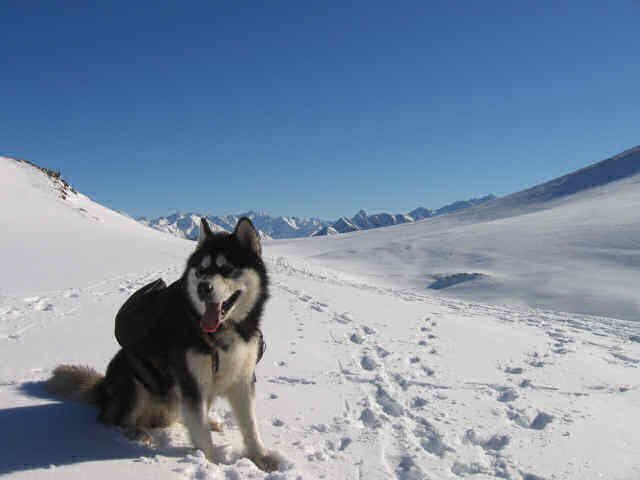 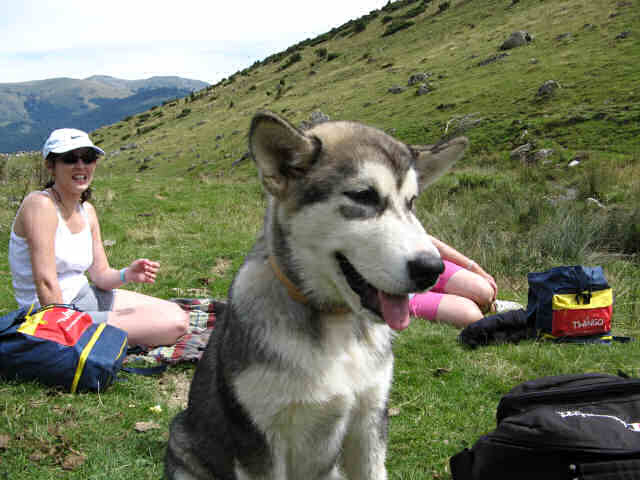 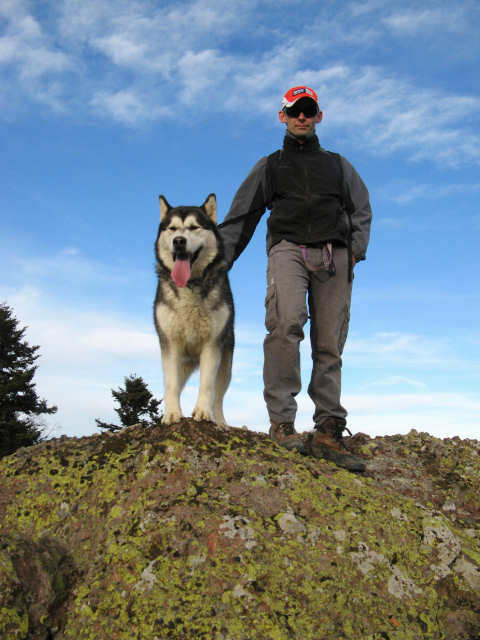 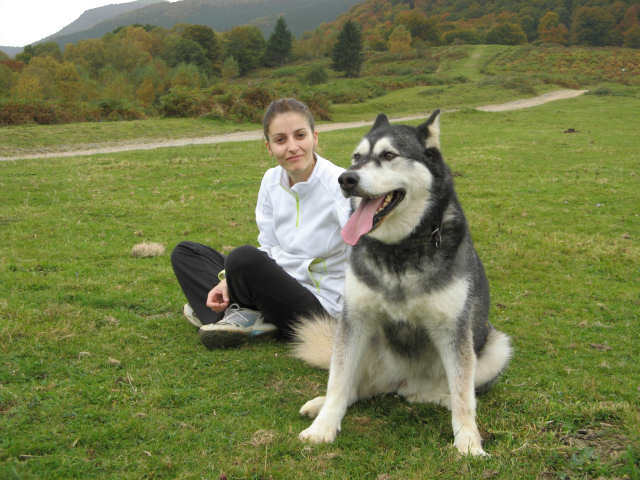 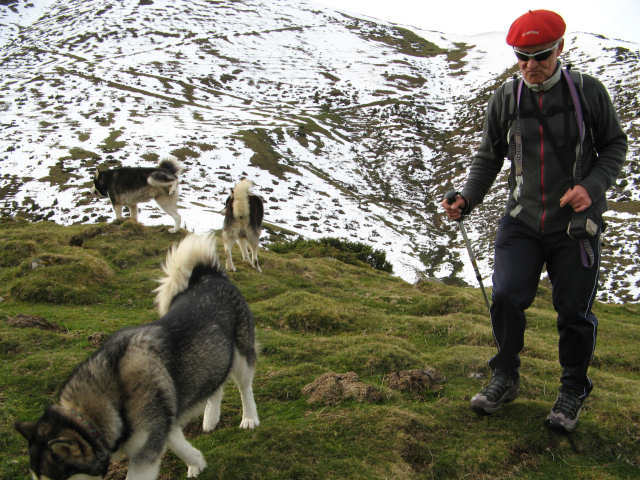 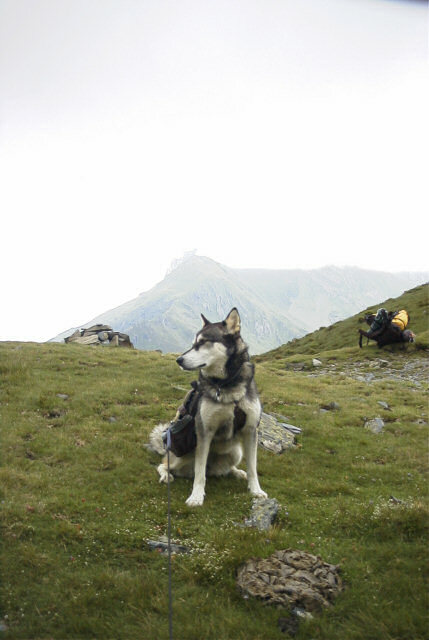 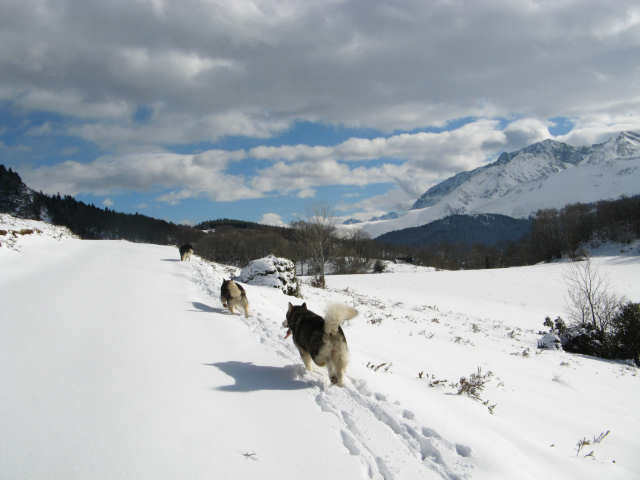 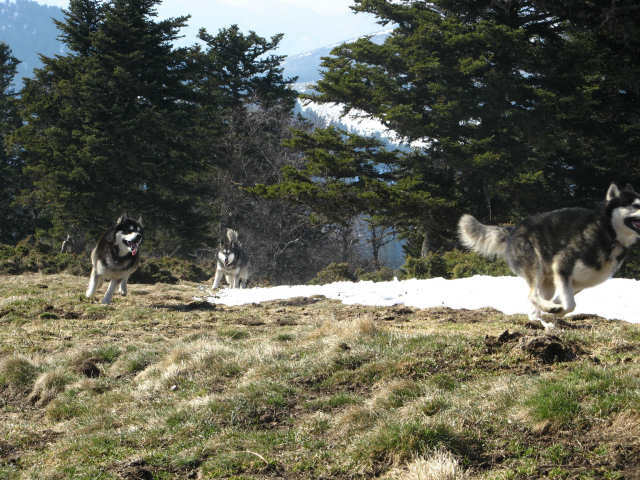 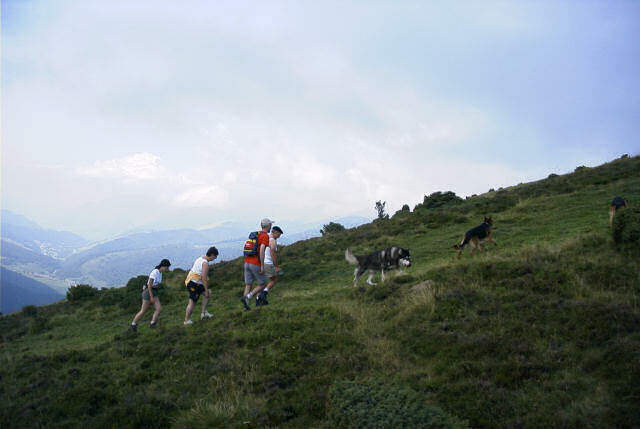 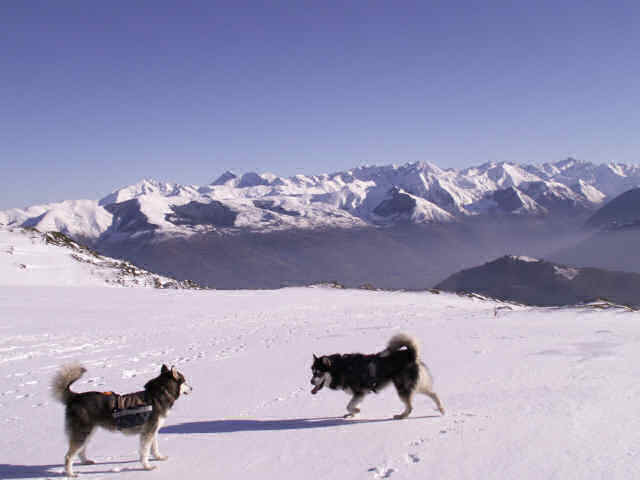 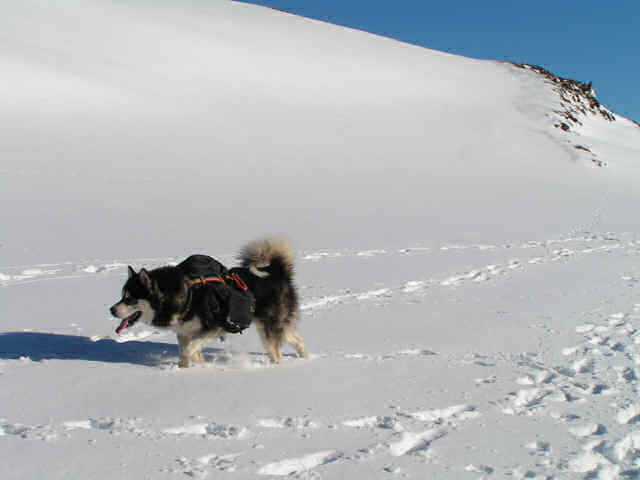 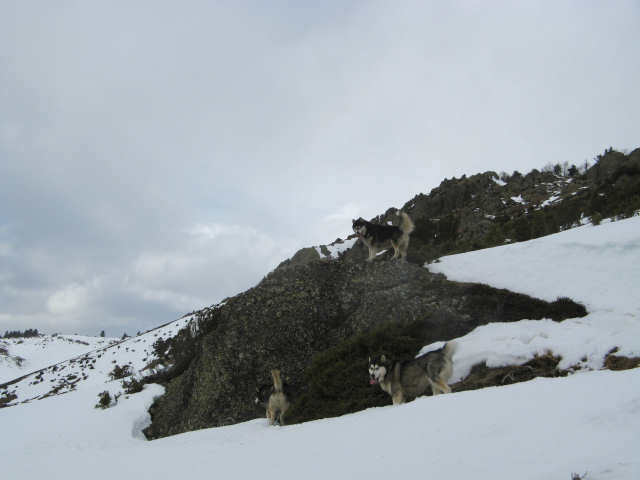 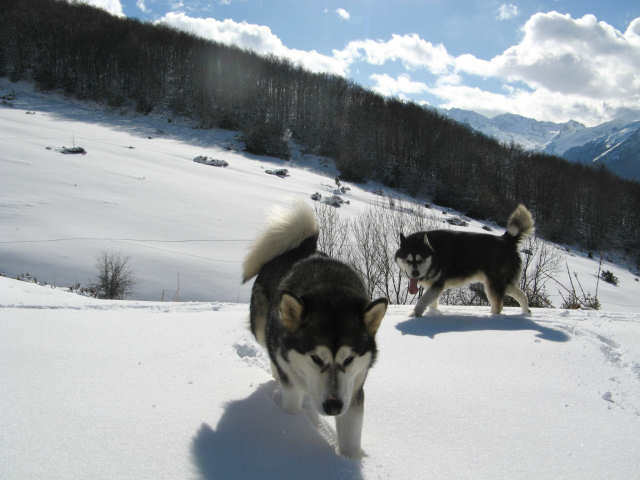 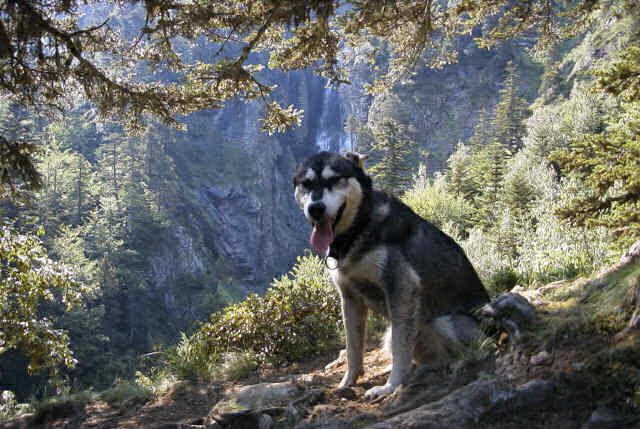 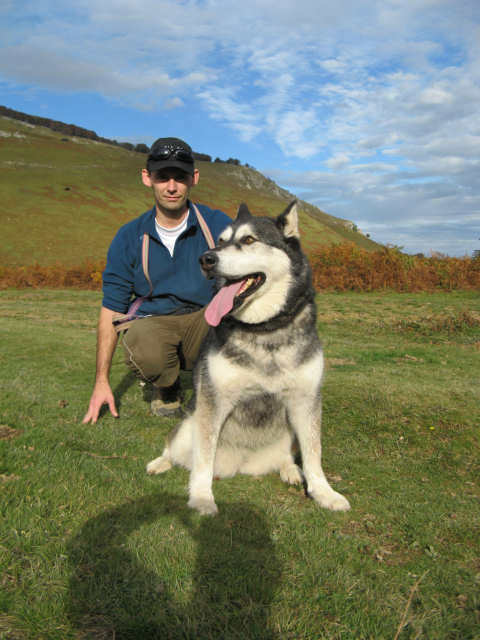 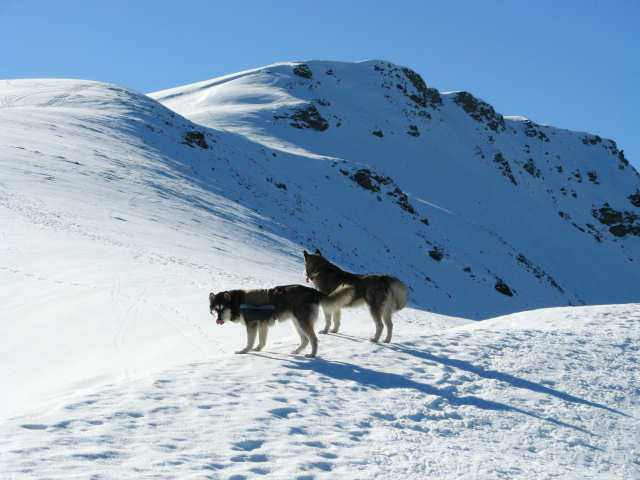 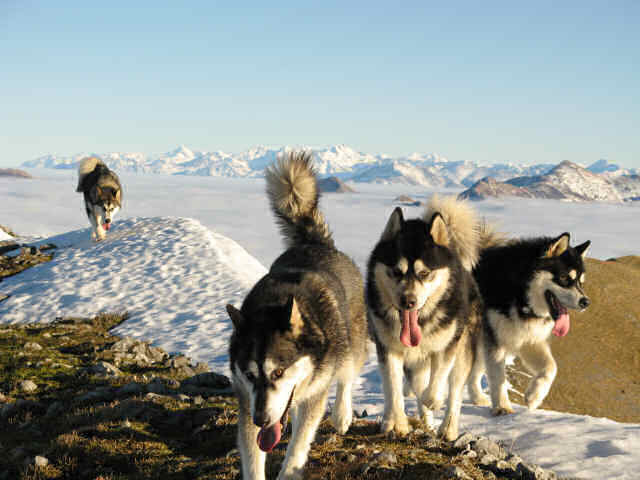 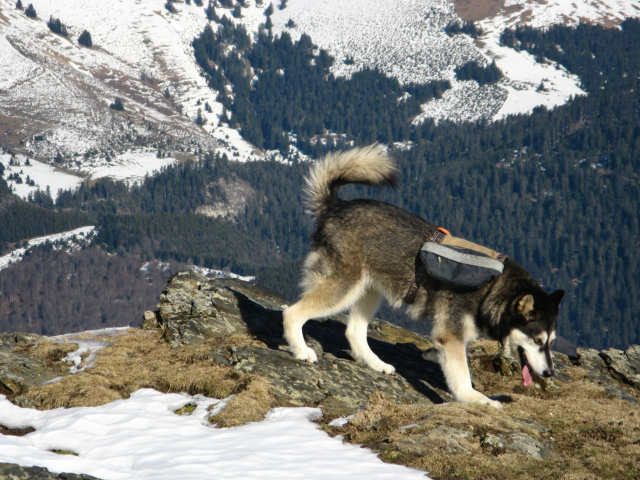 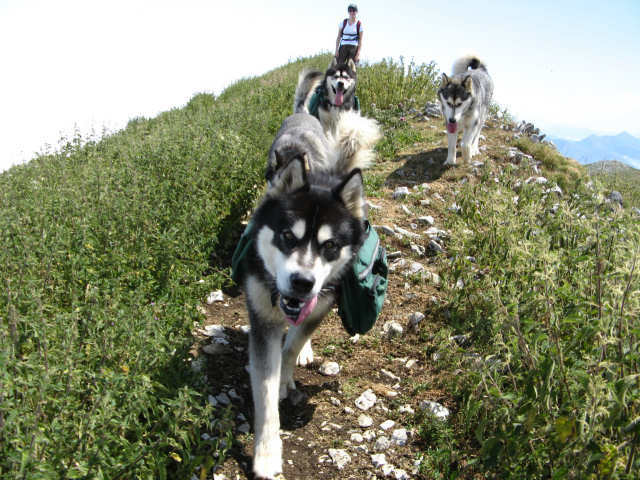 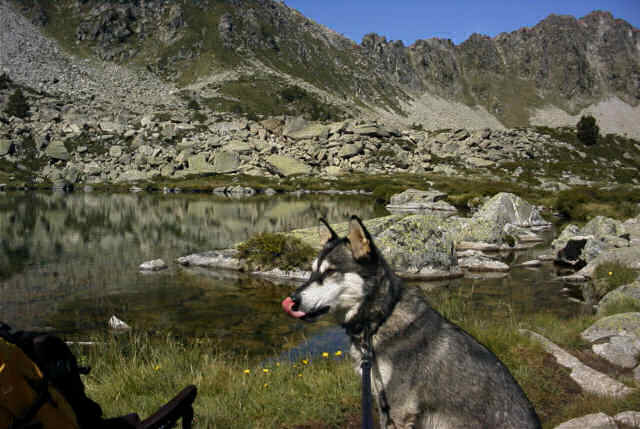 The malamute is a work dog who loves to work, hiking in the mountains are an excellent way to give him job. 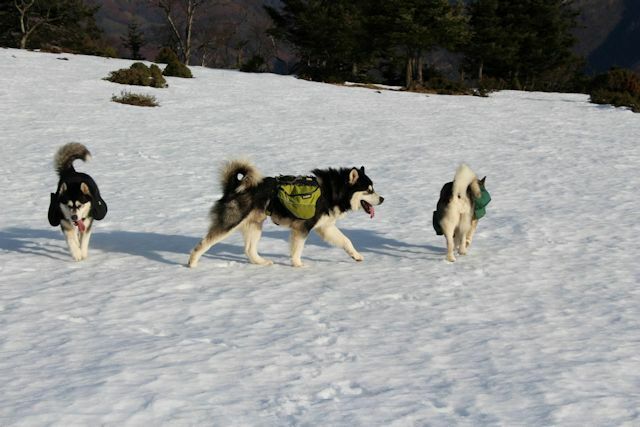 Very often, I put to my dogs, transport bags which are made manually or found in shop. 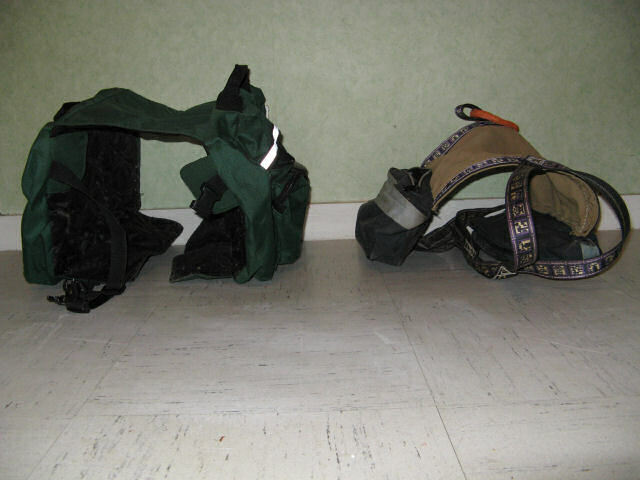 These bags enable to wear things not too fragile (box canned, croquettes, clothes ...) taking care of wrap in plastic bags. 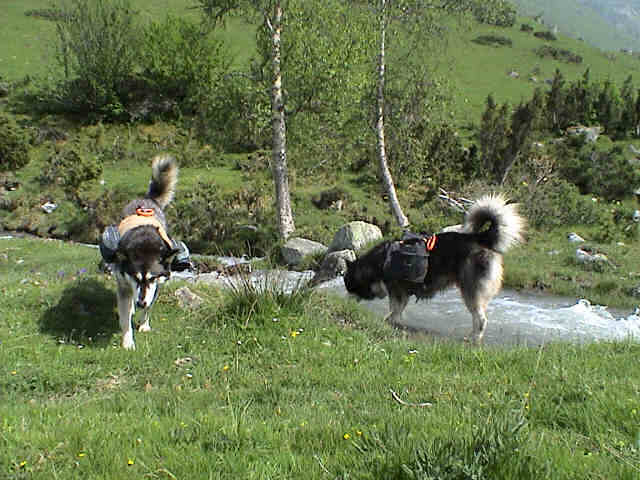 And even if there's nothing to carry, you can put a few stones to simulate a load. 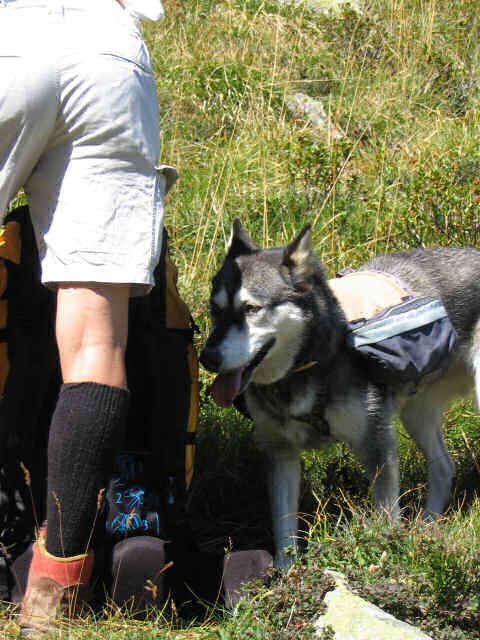 Other hikers we meet are often amazed to see our dogs wore their bags like them: they have respect for our dogs. 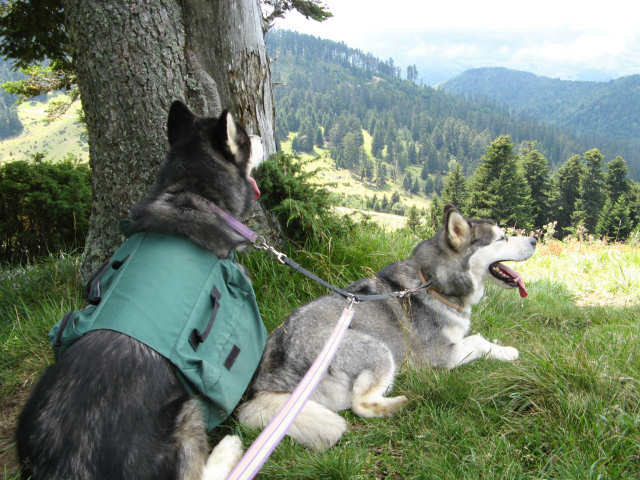 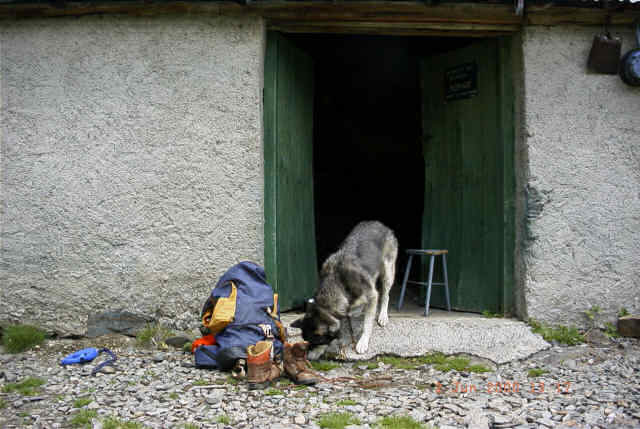 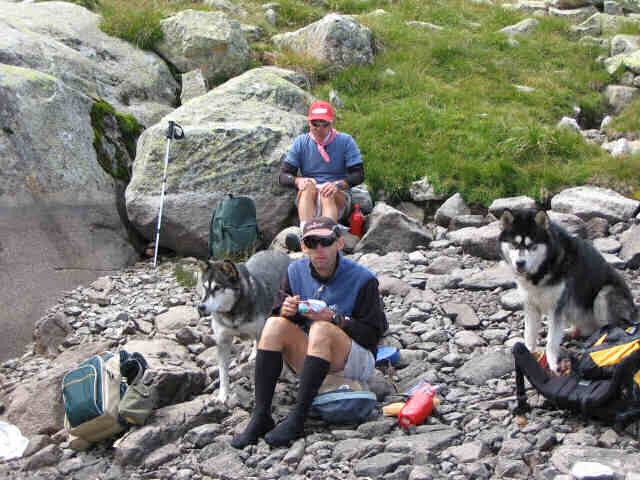 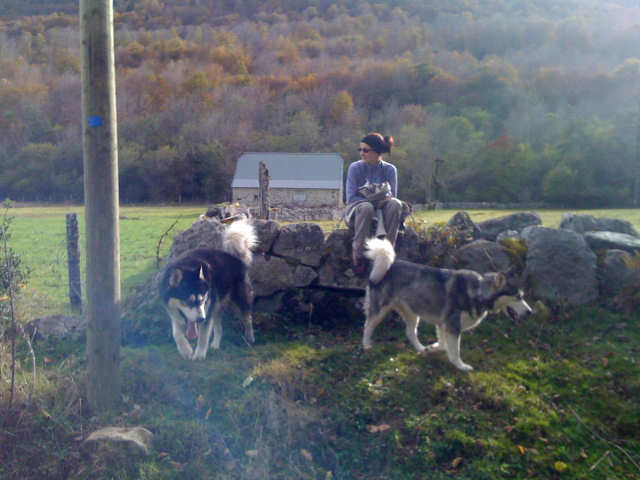 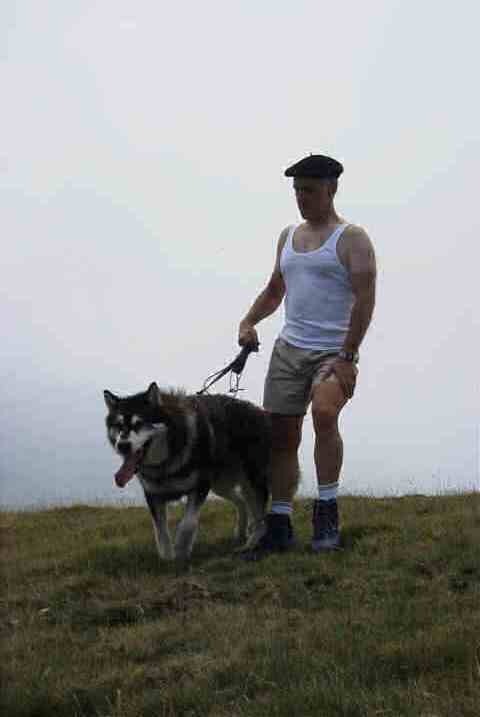 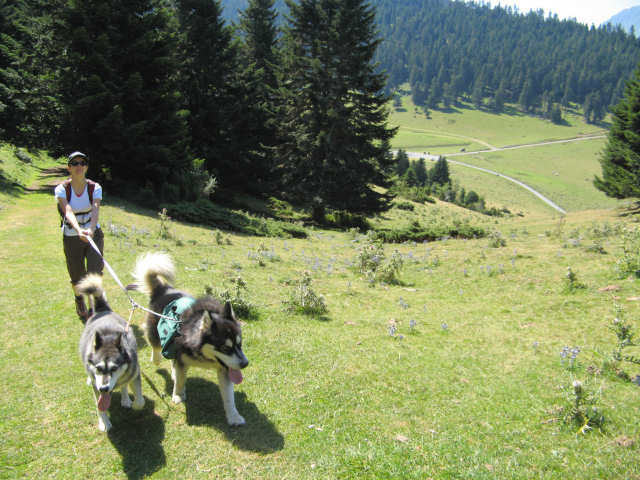 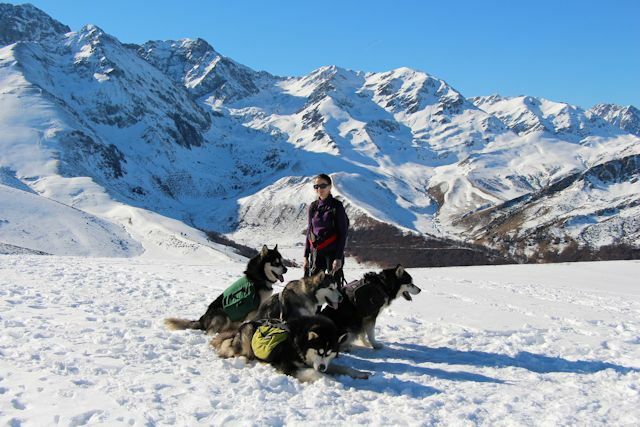 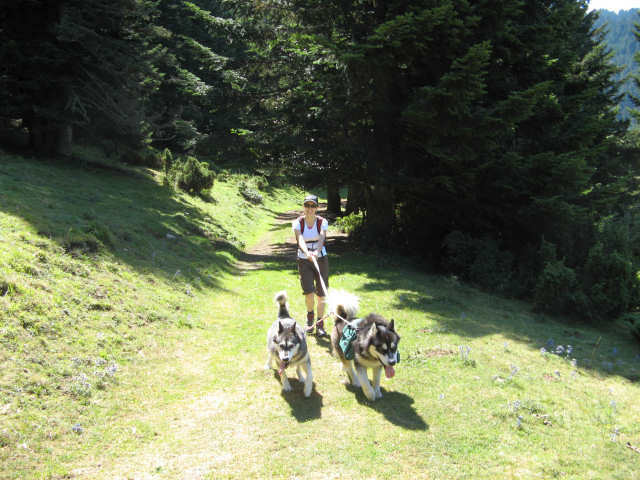 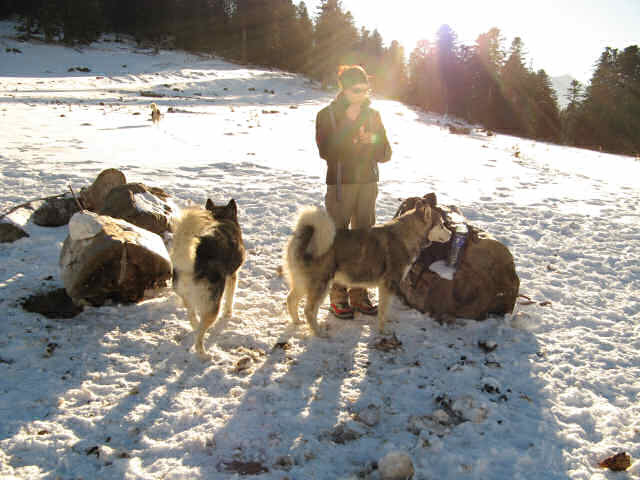 I also always take their leashes because we meet very often cattle in the mountains and Malamutes are great hunters. 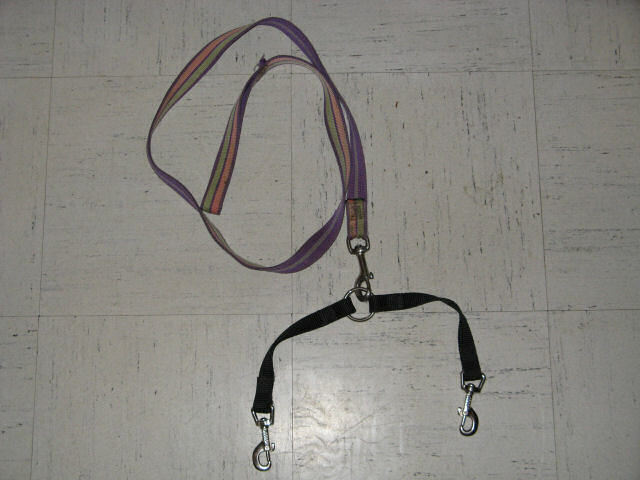 For walking with several dogs with one leash, we need a leash splitter. 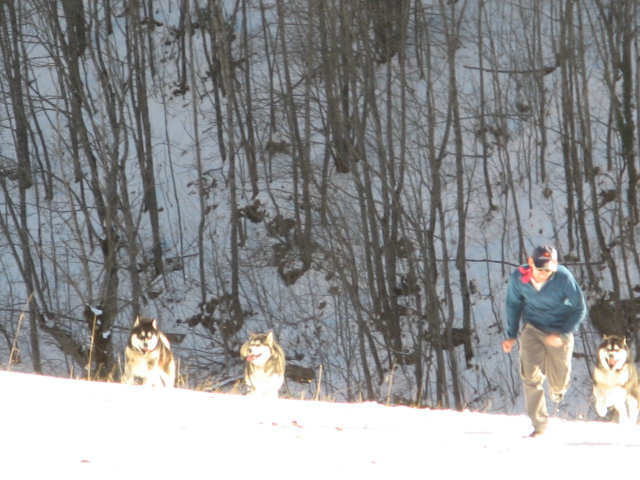 And of course the camera to freeze unforgettable moments. 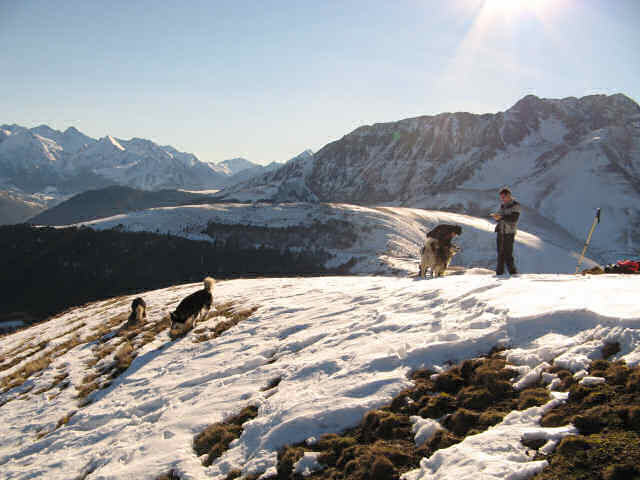 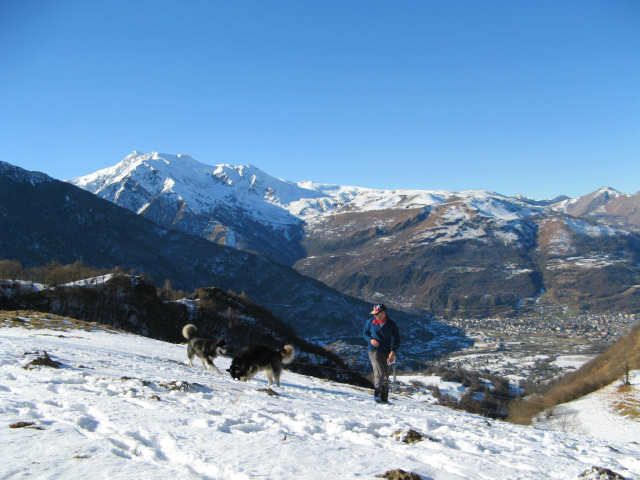 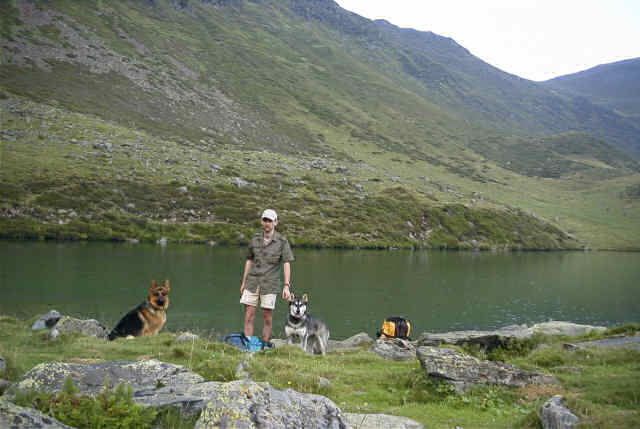 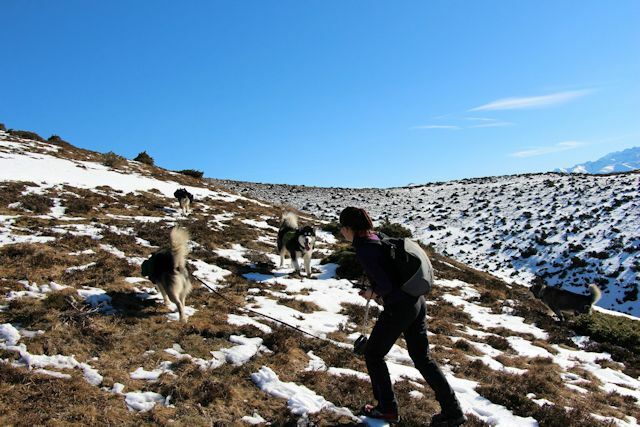 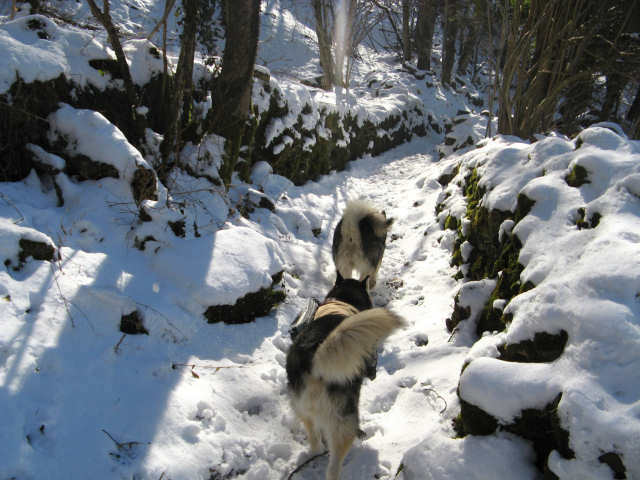 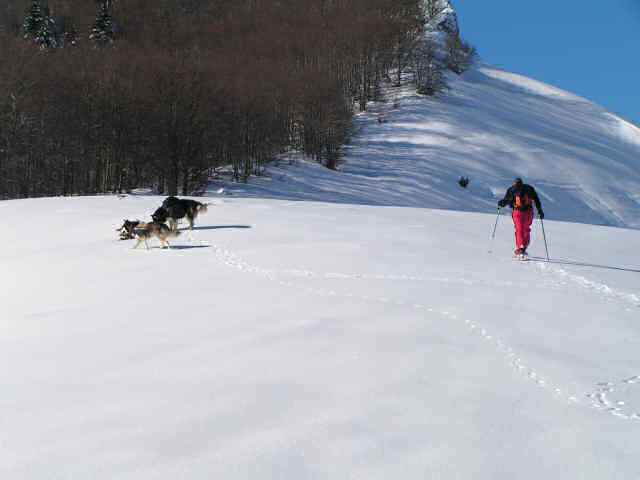 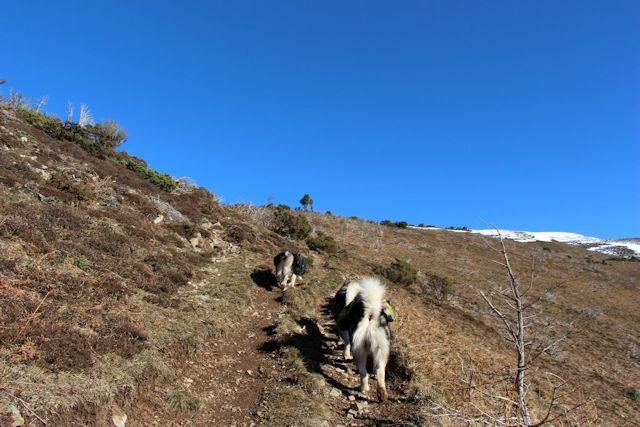 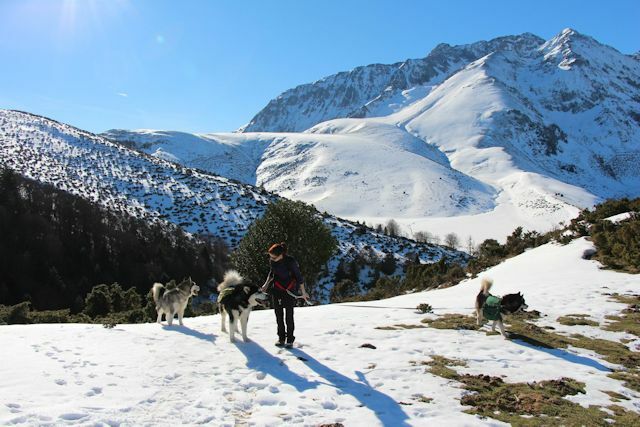 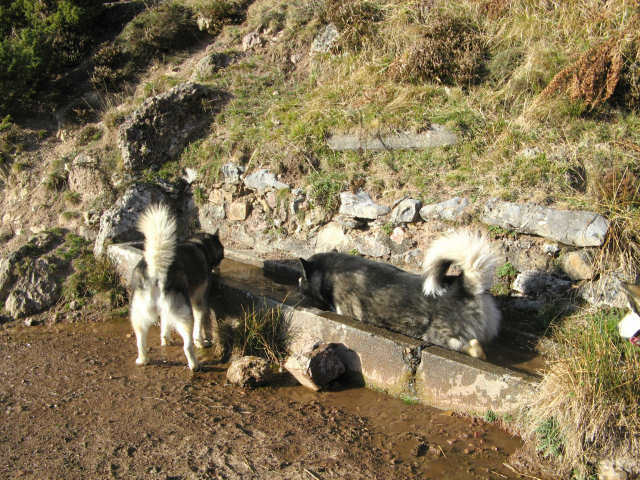 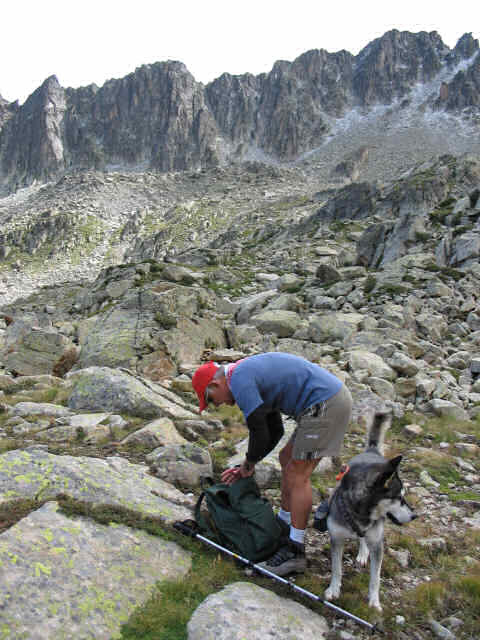 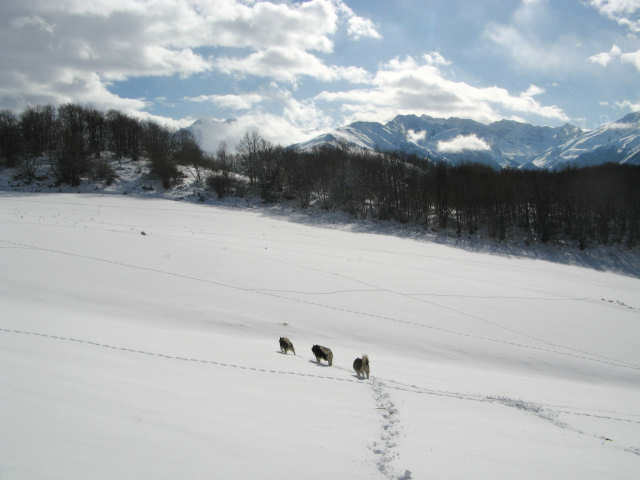 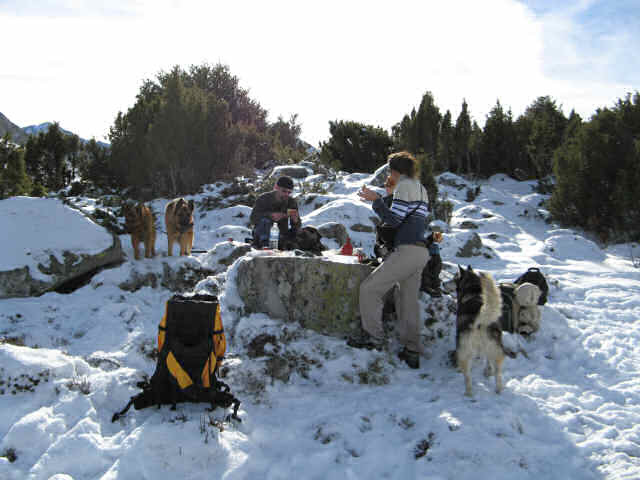 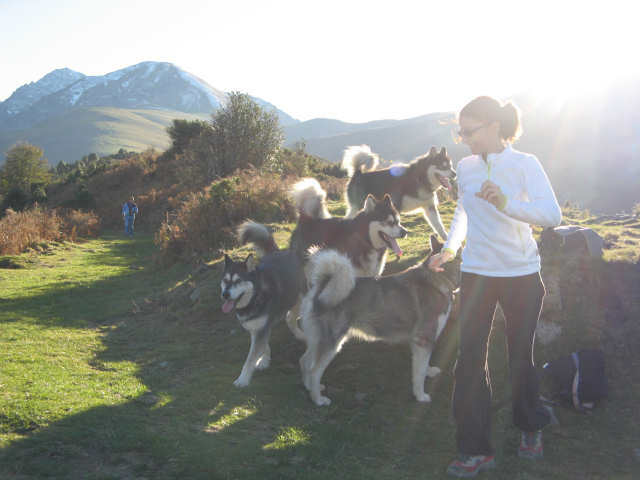 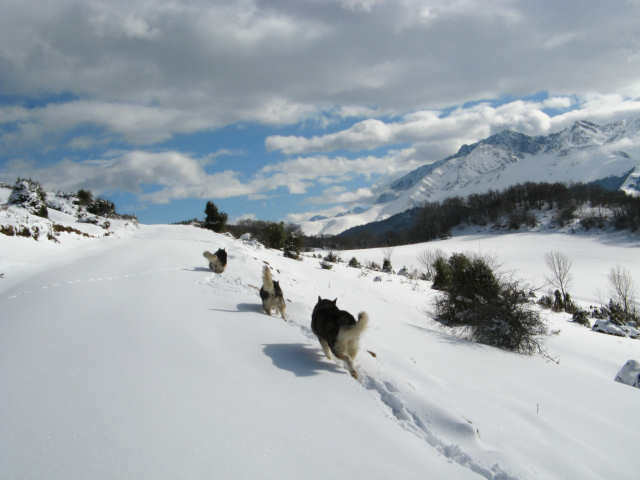 In mountain hiking, I always try to choose routes with a maximum of thirst-quenching resource for my dogs. 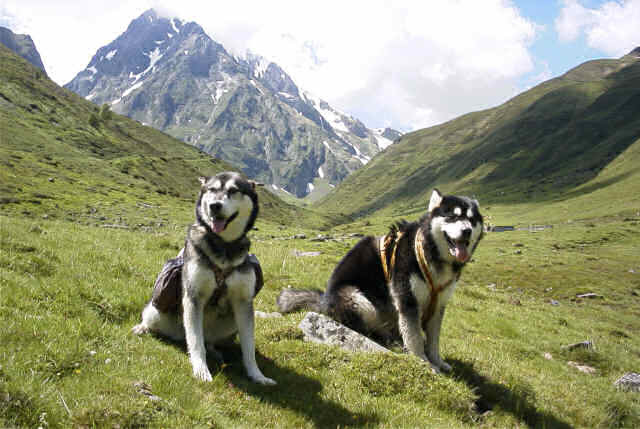 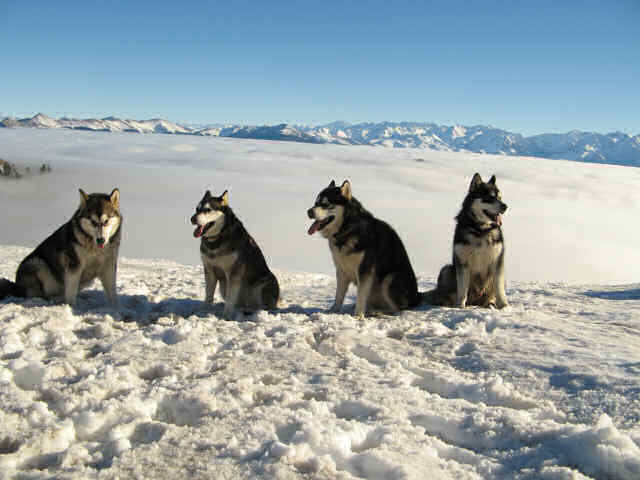 We must not forget that these are sled dogs. 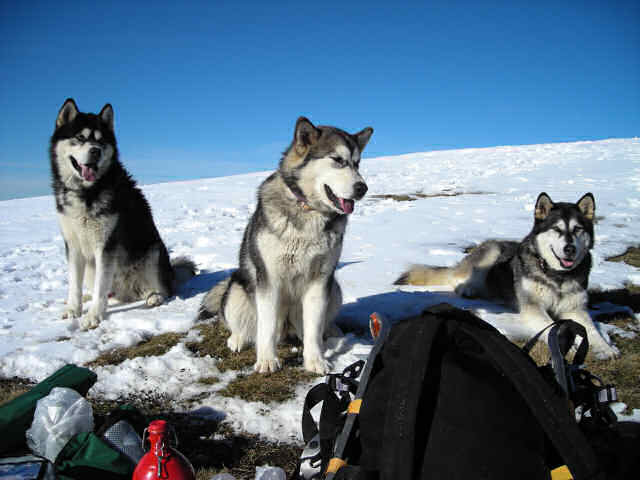 They support very well the reasonable heat if they can drink very often. 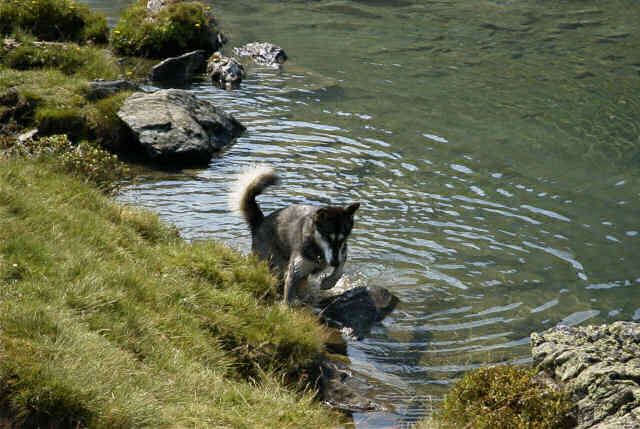 I always choose paths with one or many rivers following the trail, or with lakes at regular intervals. 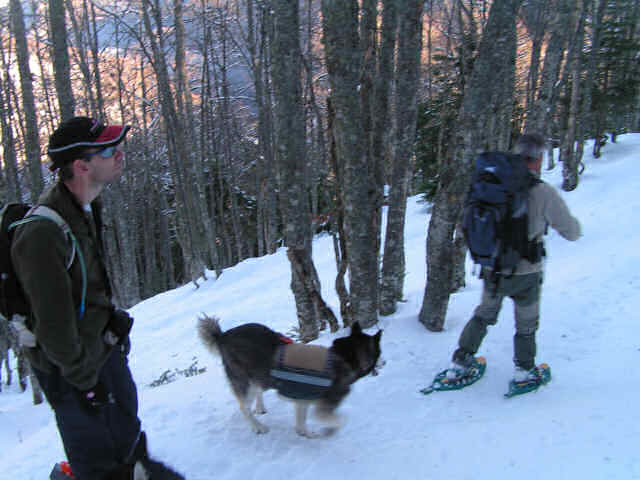 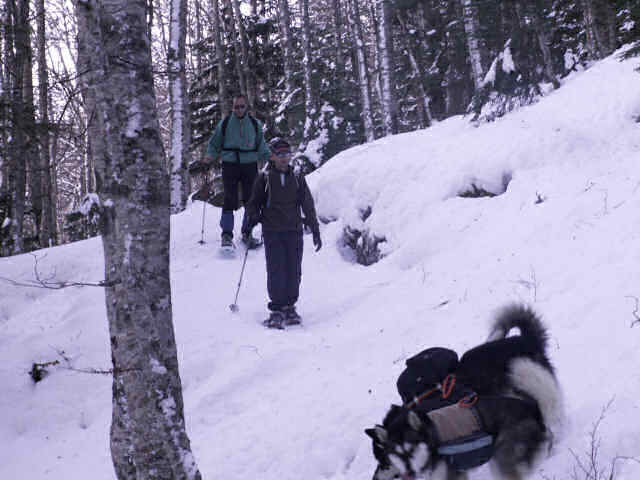 With snowshoe hiking, there is no water problem. 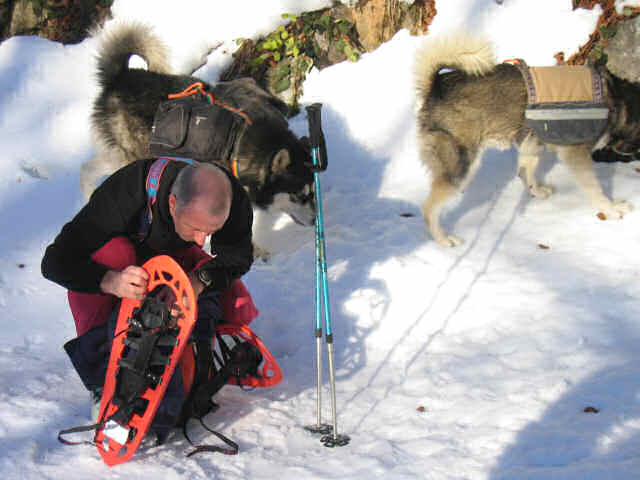 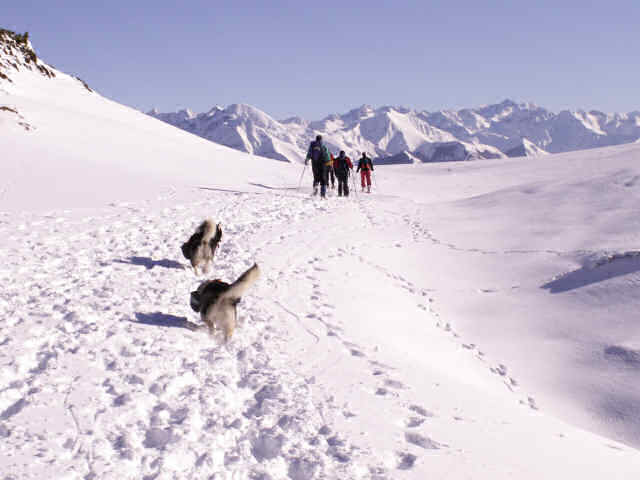 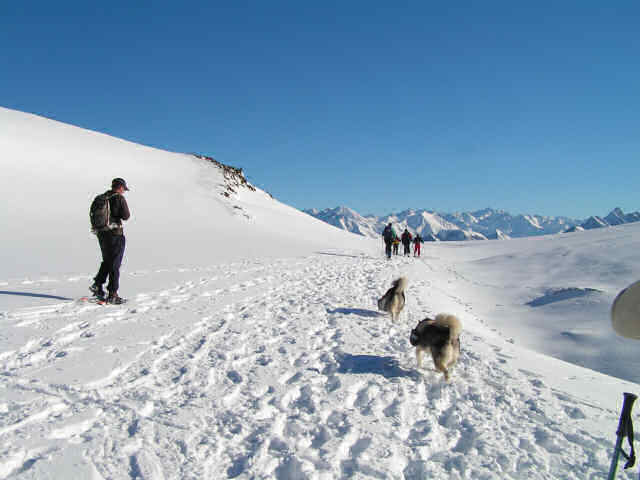 We must just think that we cannot run easily with snowshoes, we should therefore do much more attention to the dogs if they are left detached.